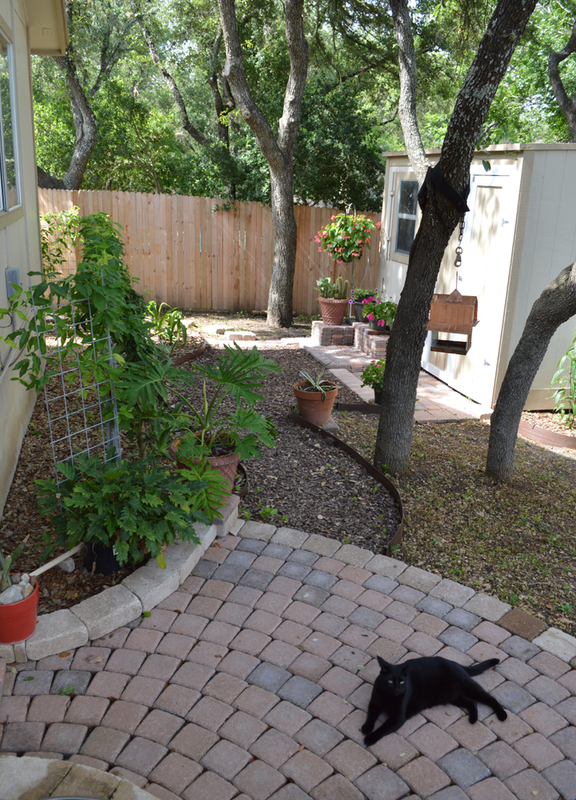 Well, almost a year ago I started the construction on our garden courtyards. We got the pavers on July 21, 2014. 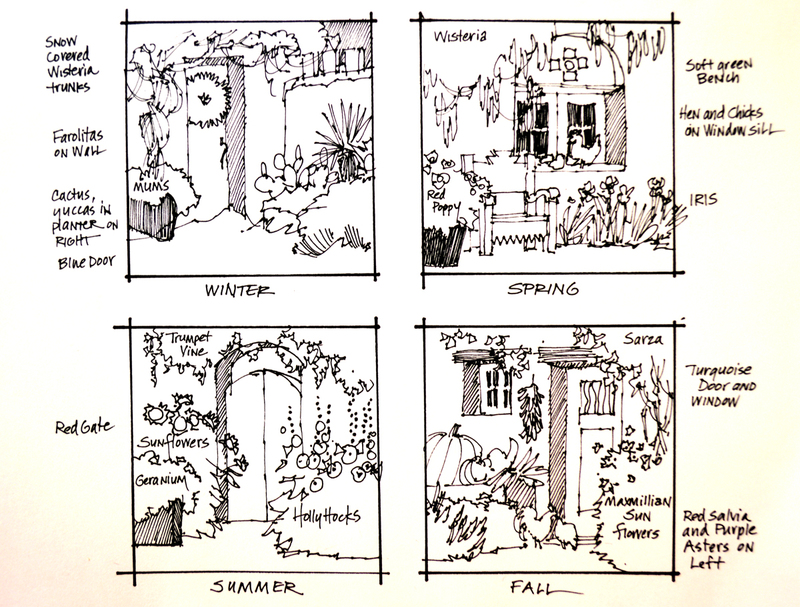 Jack and I designed the gardens, I did the construction work. We had a general plan in mind, but made a few changes and additions as I went along. 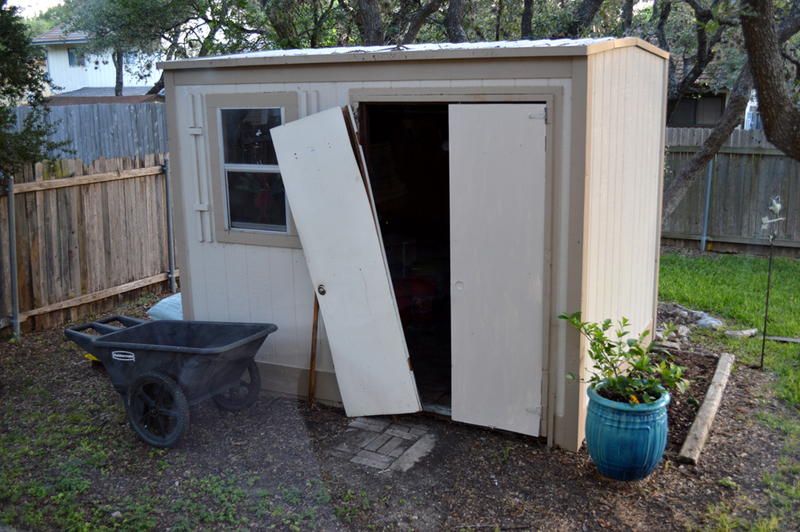 So…..thought you’d enjoy a few before and after photos. 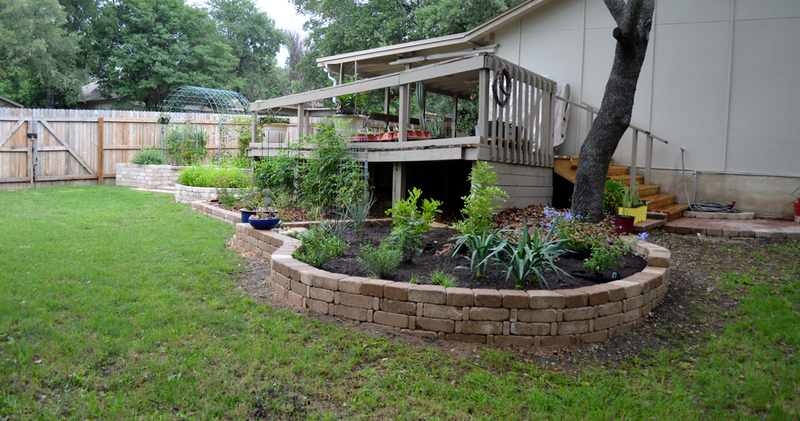 Here’s the kitchen garden when we first arrived. 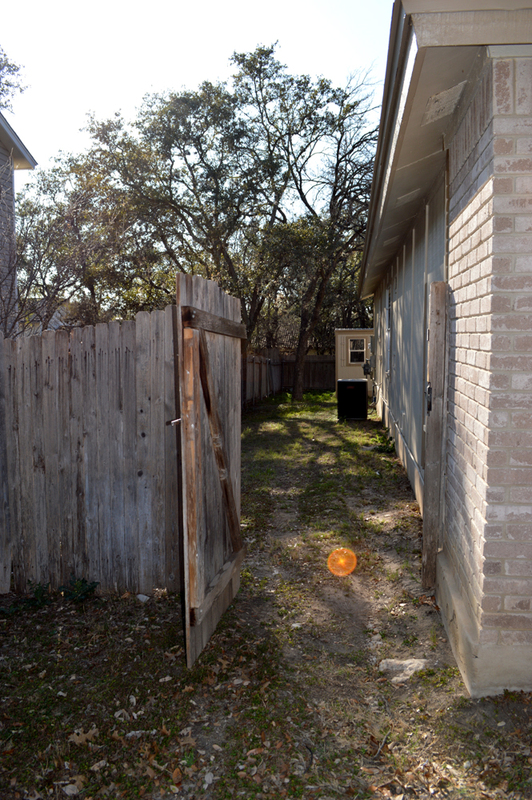 One of the first things we had to do was replace the fence, it was more holes than boards. The kitchen garden now. Please remember, as you go through the blog you can click on the pictures to see them larger. 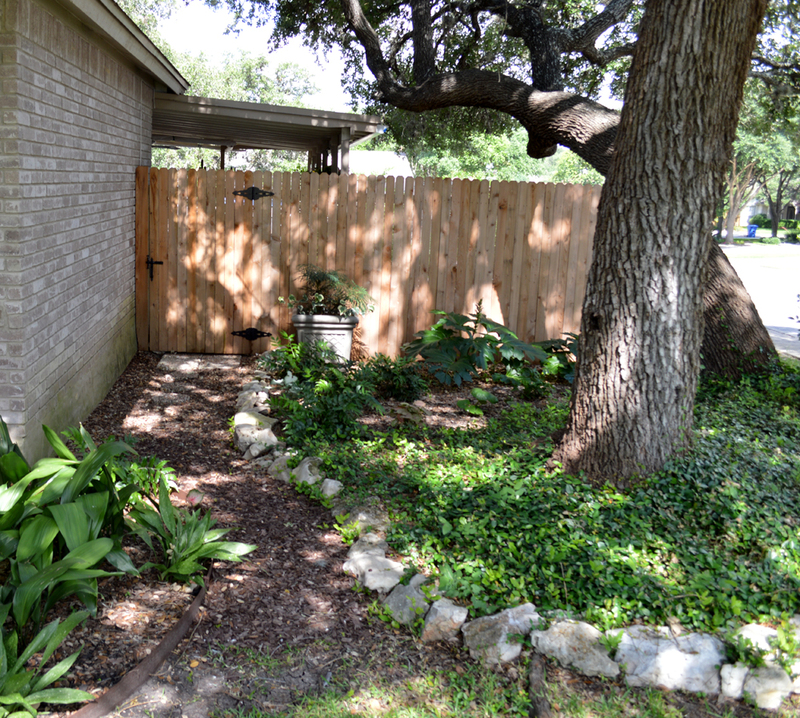 A Vitex Tree is on the left, it had purple blooms in the spring. It will rebloom later in the summer. 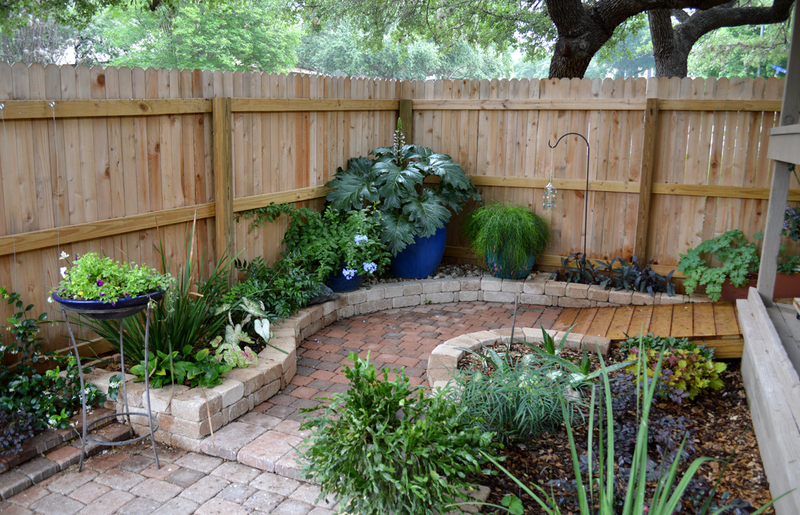 The red-orange flowers of a Pride of Barbados or Mexican Bird of Paradise are peeking out from behind the Vitex. Here is the same area from the other end……….. 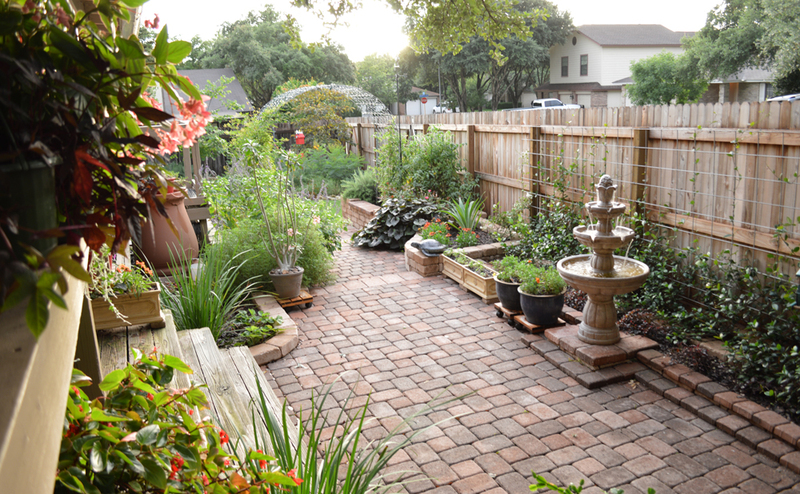 The plants in the lower left corner are Amaryllis. 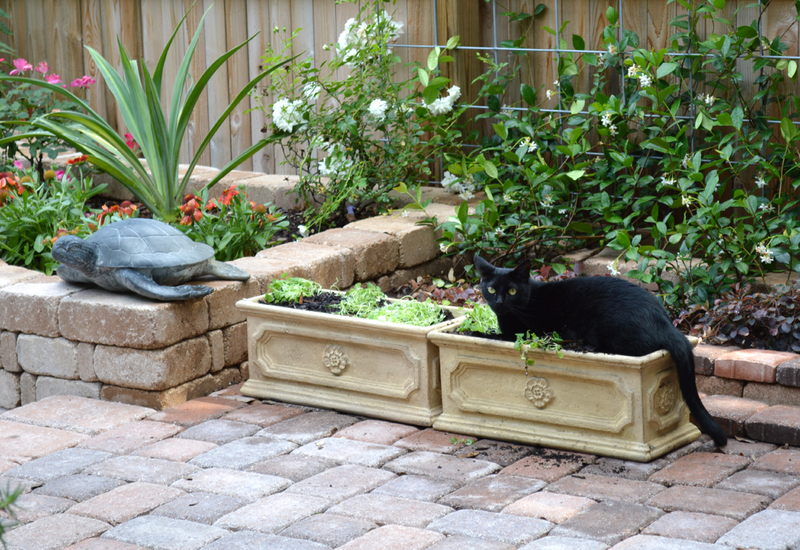 After Christmas Jack suggested we plant them in the garden, they’ll bloom in the spring. Cross Vine is on the trellis. By the end of summer the electrical panel should be pretty much concealed from view. 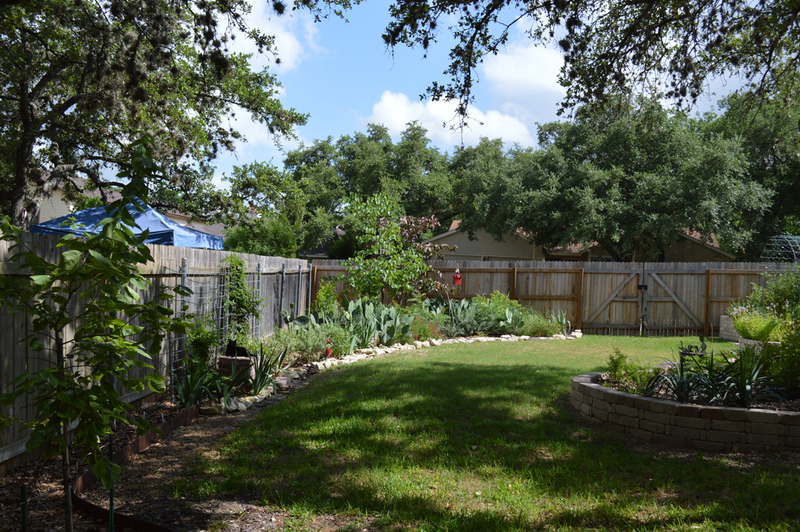 Mexican Butterfly Vine is growing up over the fence on the right. The seed pods are so neat, they look like butterflies. I collect the dried ones and put them on our Christmas tree. 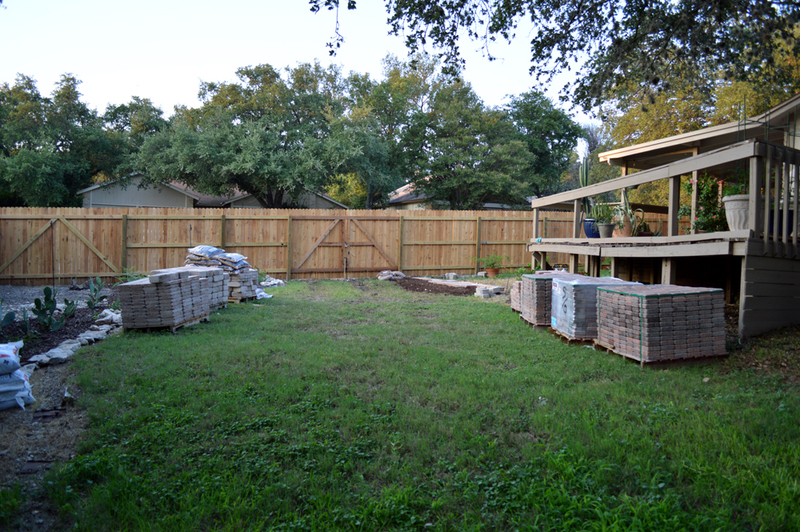 The back yard was a mess, this is after I cleared out most of the bricks and trash strewn about. 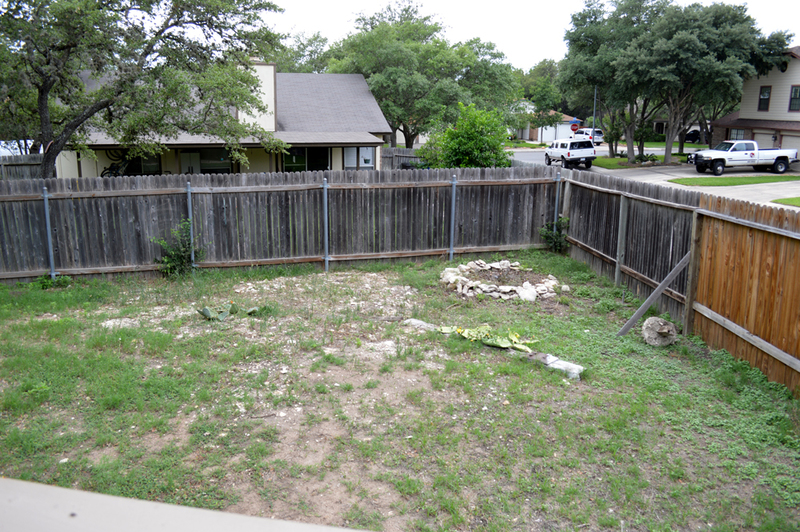 Here’s the backyard now. Molly is happily reclined on the resting bench on the left. This is the view of them from above. Isn’t this a neat detail? 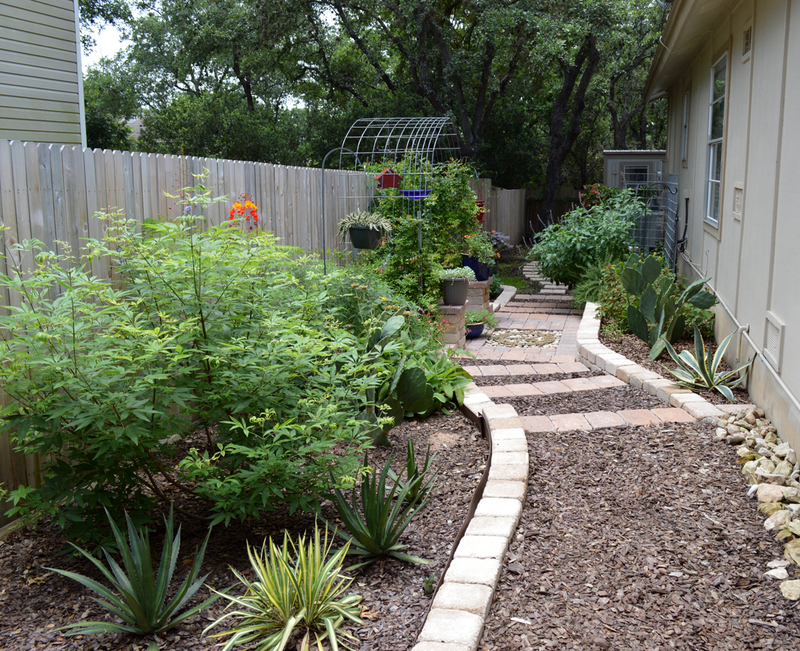 Jack came up with the idea for the transition between the planting areas. 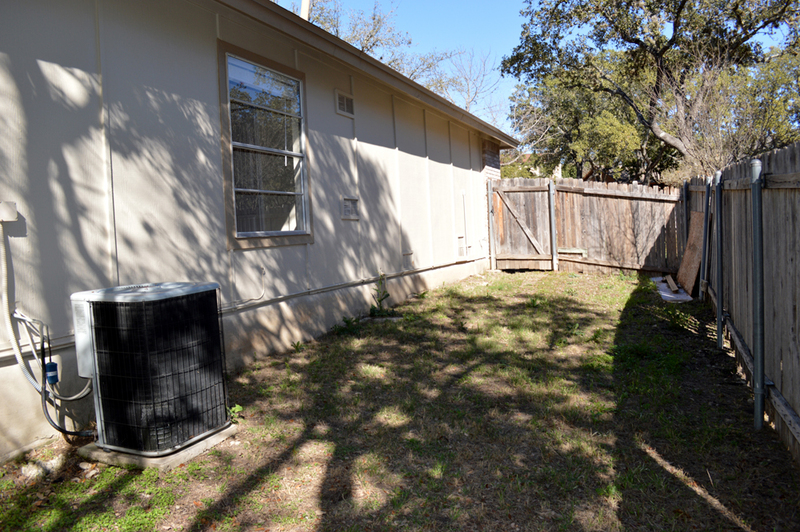 Coming up from the backyard to the north side of the yard. This is what it looked like when we first arrived. The Boxwoods were the first to go. 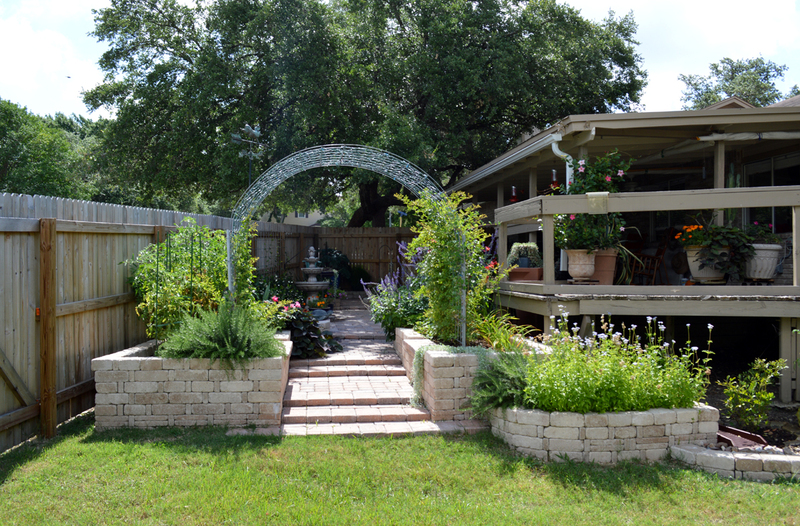 The Rose Arbor is a 20 foot long Livestock Panel. We arched it over and anchored it to steel posts. Blue Mist is blooming in the bed on the right, butterflies love it. When you go by they fly up; making you feel like you’re walking through a cloud of butterfly wings. If you enlarge the image you can see the Fountain Courtyard. The trellis on the fence of the Fountain Courtyard is another Livestock Panel. Confederate Jasmine is growing up the wall, eventually it will drape over. When it blooms in April and May the fragrance is amazing. The walk from the Fountain level curves up to the ramp to the deck. 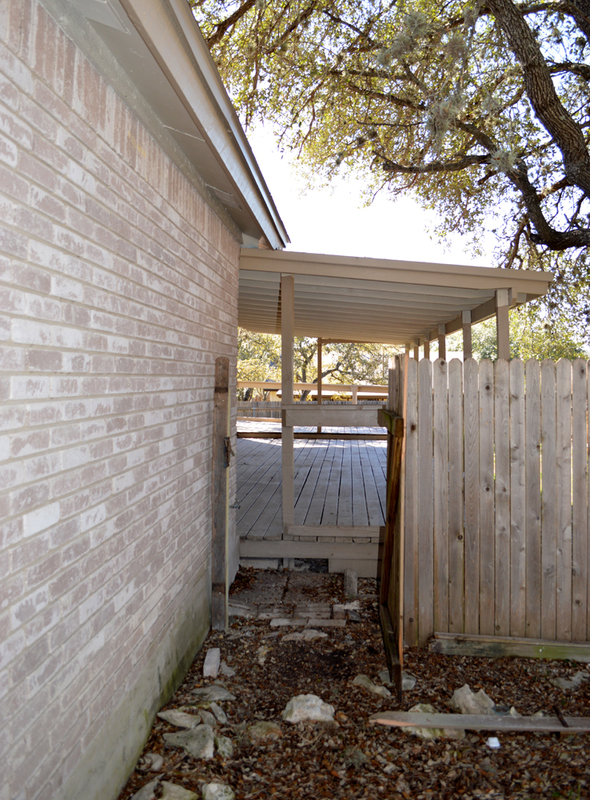 The area alongside the house outside the gate opening to the deck was also pretty much a disaster. 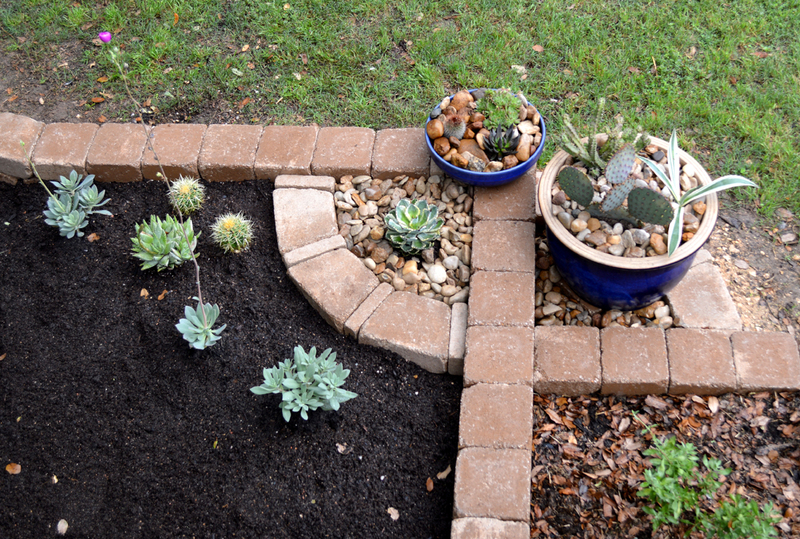 I moved the lost rocks and made a planter. It’s much more inviting now, what do you think? 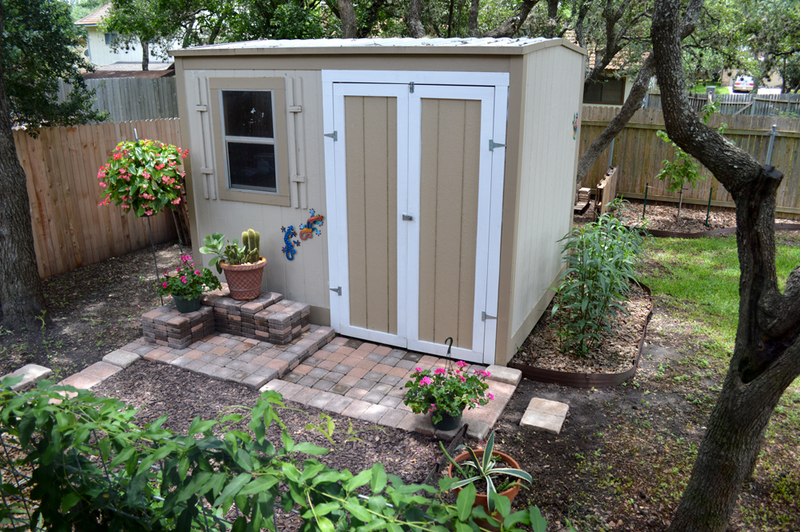 I was so thrilled our new home had a small barn for all of my garden stuff. However, it did need some work. New doors and a few pavers make a huge difference. I love geckos, Jack surprised me with these. Aren’t they cute? 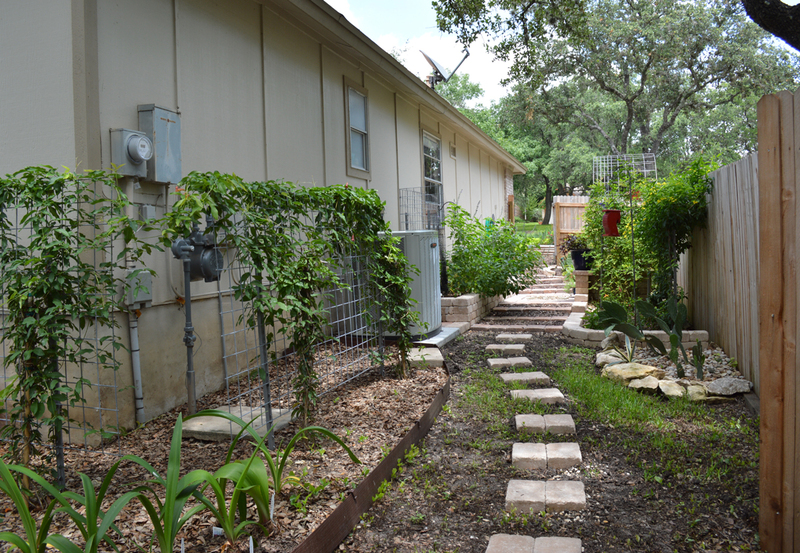 Cross Vine is planted on the trellis under the window, it’s a continuation of the one that conceals the utility meters. When it blooms the Hummingbirds will flock to the orange blossoms. Molly and Sissie are going to go nuts, watching them from the window sill. 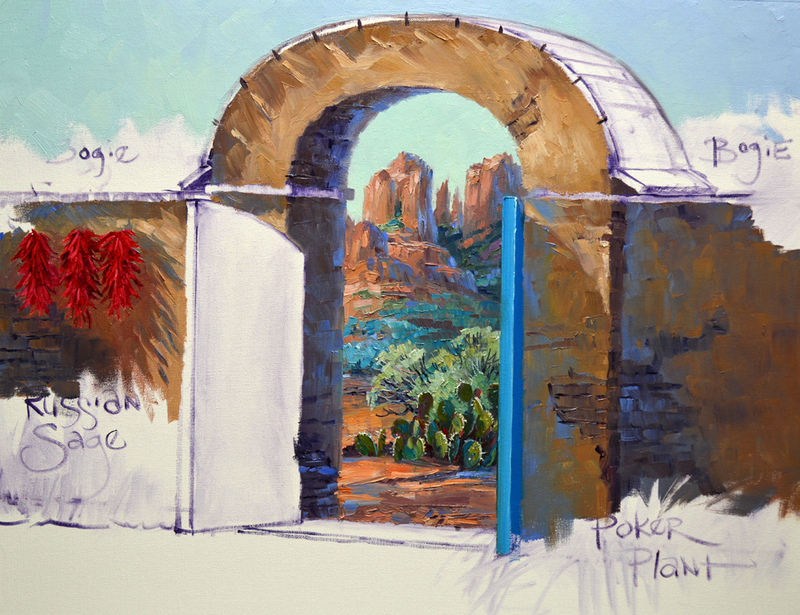 The double arched gate is painted with two different shades of Pthalo Blue + White. I brace against the mahl stick to steady my hand as I draw the fine lines indicating the separate panels. VIDEO! 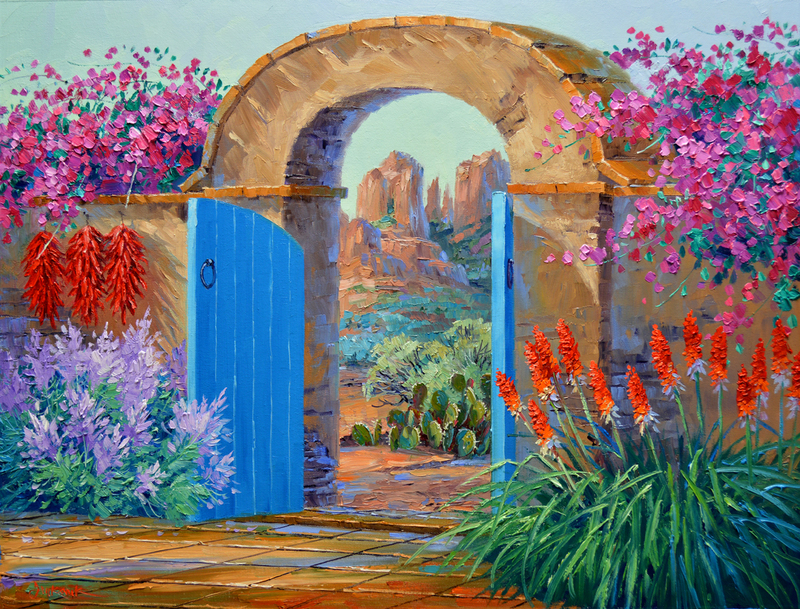 Let’s paint the lacy Russian Sage. Several mixes of Dioxazine Purple + White are used for the feathery blossoms. Our Russian Sage is complete. One of our readers asked a great question the other day. She wanted to know why I had painted the Chili Ristras before doing the wall behind them. Actually, at the point she saw them, they were only washed in with Alizarin Crimson + Liquin. I had done that when the painting was first sketched up on canvas. Now that they are completely dry I’ve come back and added opaque brushwork. This helps to shape the individual peppers and give them dimension. You can click on the picture to see it larger. 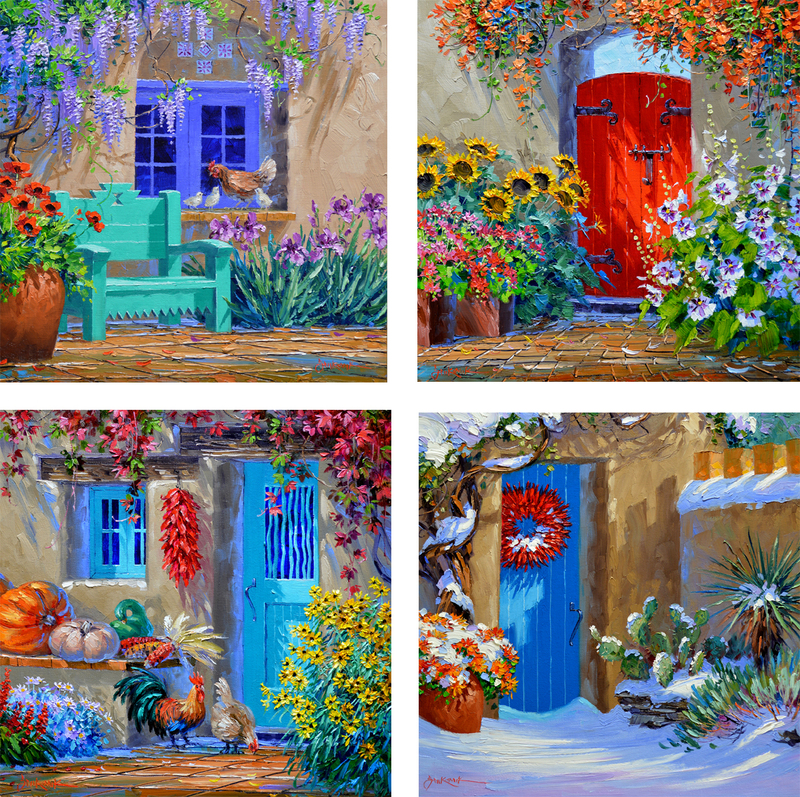 In fact you can do this with any of the images on my blog. 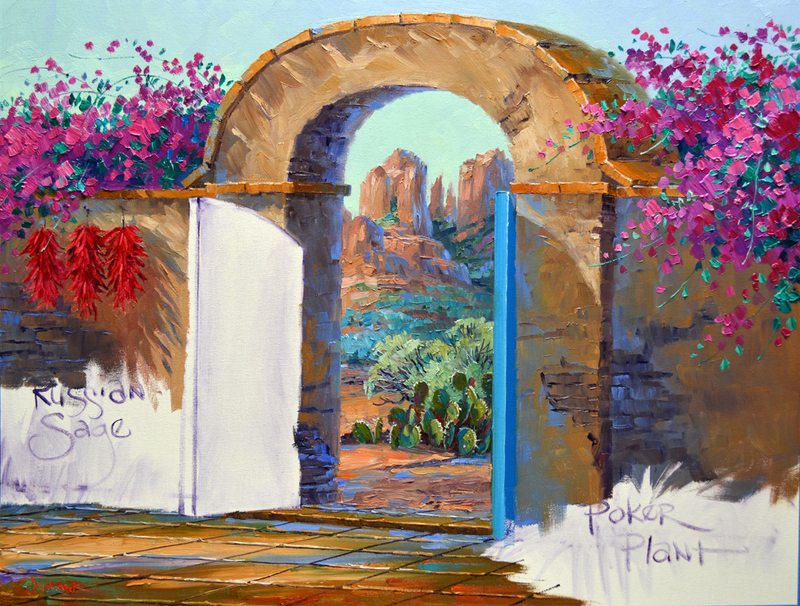 I reverse my usual sequence of Flowers First, Leaves Last to paint the Poker Plant. Since the flowers dance high above the long, strap-like leaves I paint the foliage first. 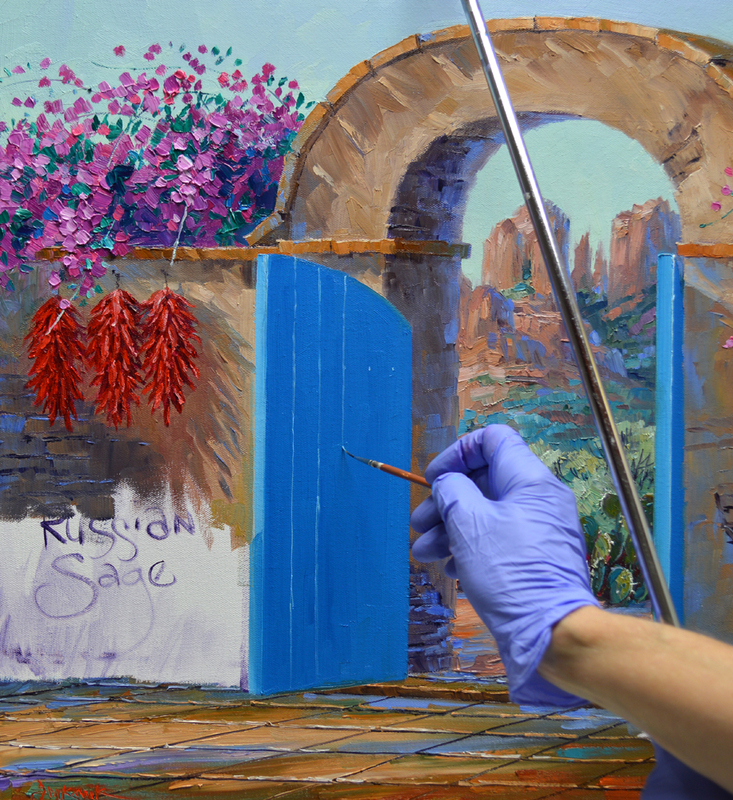 To add the blooms, I’ll gently “Lay” the brushstrokes on top of the underlying color. This way my brush won’t pick of any of the wall paint and muddy the bright blossoms. The floor is now blocked in. I paint the entire surface, establishing the light and shadow pattern. Next perspective lines separating the individual tiles are drawn into the wet paint. 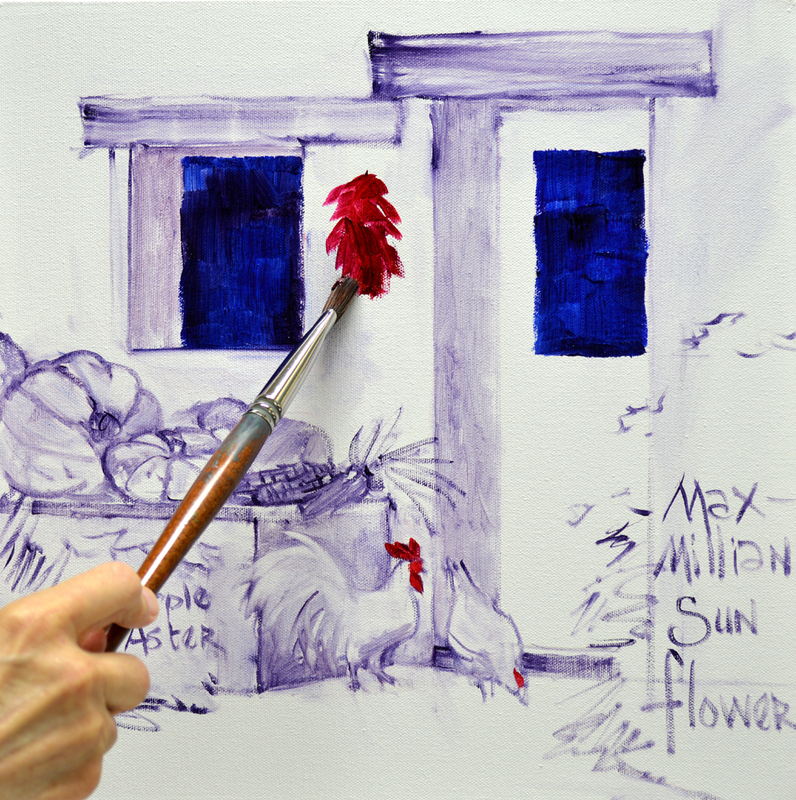 Using a fine liner brush I work freehand, using the mahl stick would limit the movement of my arm. It would be difficult to make the lines straight. 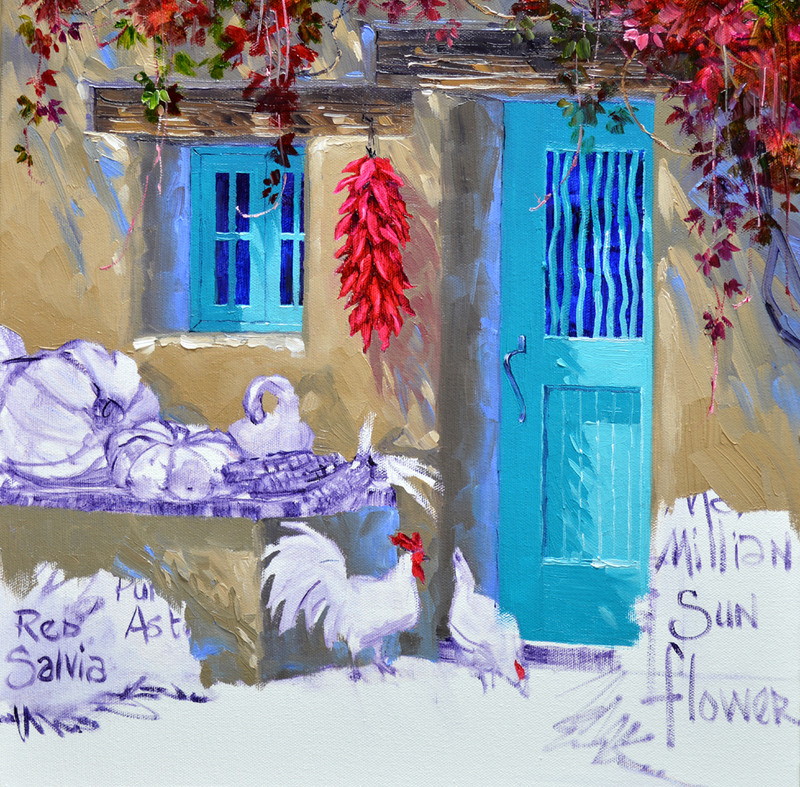 My paint is mixed for the Bougainvilleas, the mixtures are as follows. #1. Magenta + White. #2. Dioxazine Purple + Magenta + White. #3. Magenta + a tiny bit of Dioxazine Purple + White. #4. Mix #3 + White. #5. Viridian Green + White. #6 Pthalo Blue + a touch of White. #7. Viridian Green + Pthalo Blue + White. #8. Mixture #5 + more White. 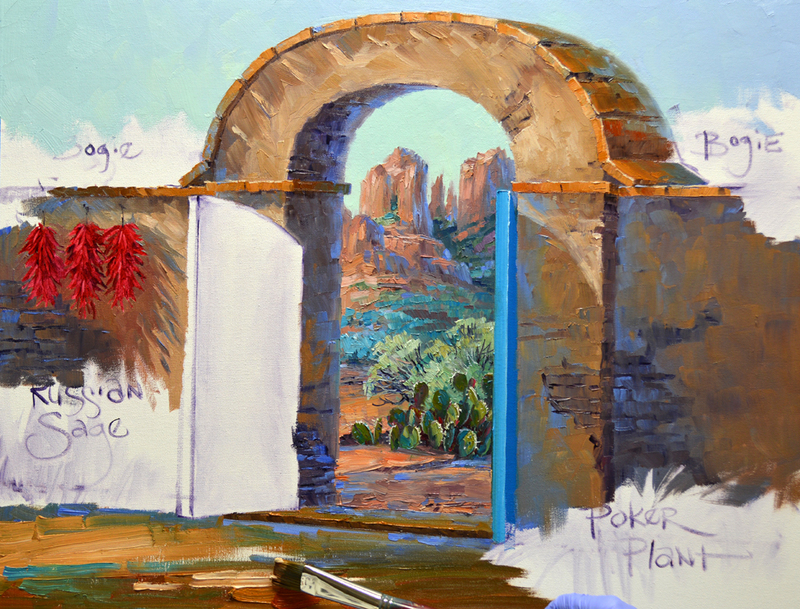 Starting a new piece for our gallery in Sedona. We took the reference picture at Mission San Miguel in San Miguel, California, just north of Paso Robles. You can click on the image to see the Mission gate enlarged. 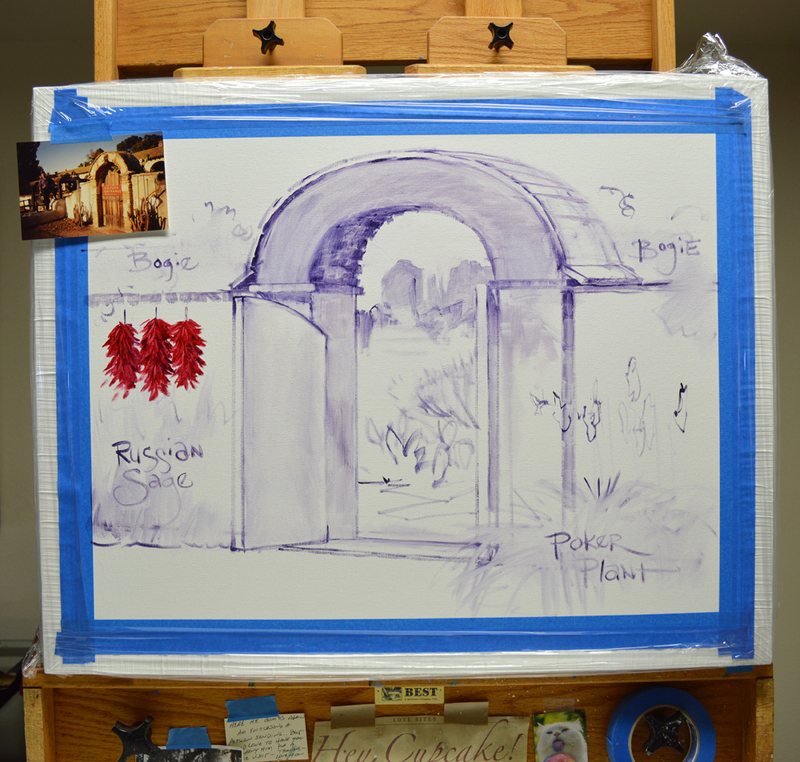 The background is painted first, then I’ll do the gate and garden. My color mixes for the sky and Red Rocks are shown here. #1. White + Pthalo Blue + a tiny bit of Lemon Yellow. #2. White + Pthalo Blue. #3. White + Cobalt Blue. #4. White + Lemon Yellow + a touch of Pthalo Blue. #5. 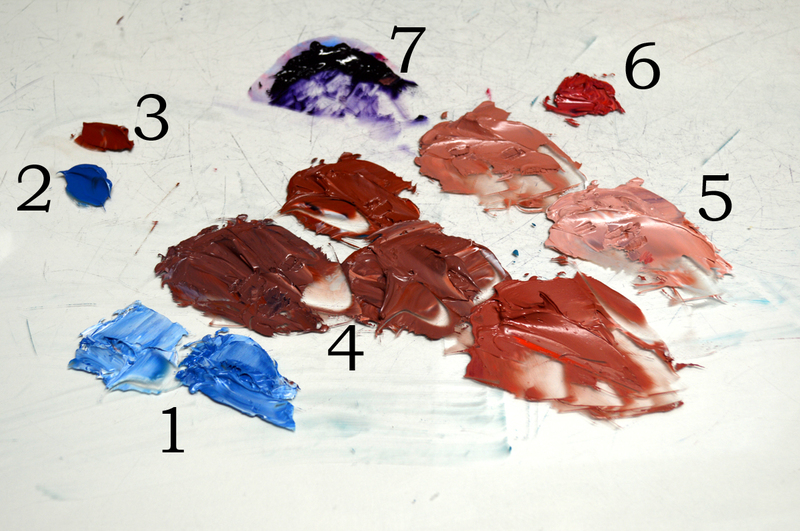 Several mixes in different proportions of MUD (Ultramarine Blue + Alizarin Crimson) + Cadmium Orange + Cadmium Red Light + White. #6. Ultramarine Blue + White. #7. Mixes of various amounts of Pthalo Blue + Cadmium Orange + White. #8. White + a little bit of Ultramarine Blue. 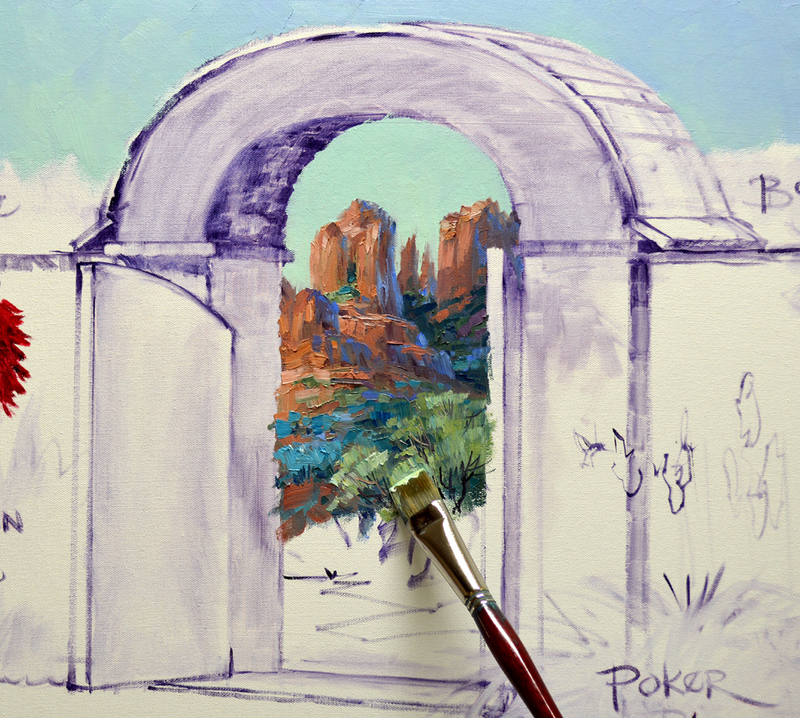 VIDEO: Painting the Red Rocks of Sedona. 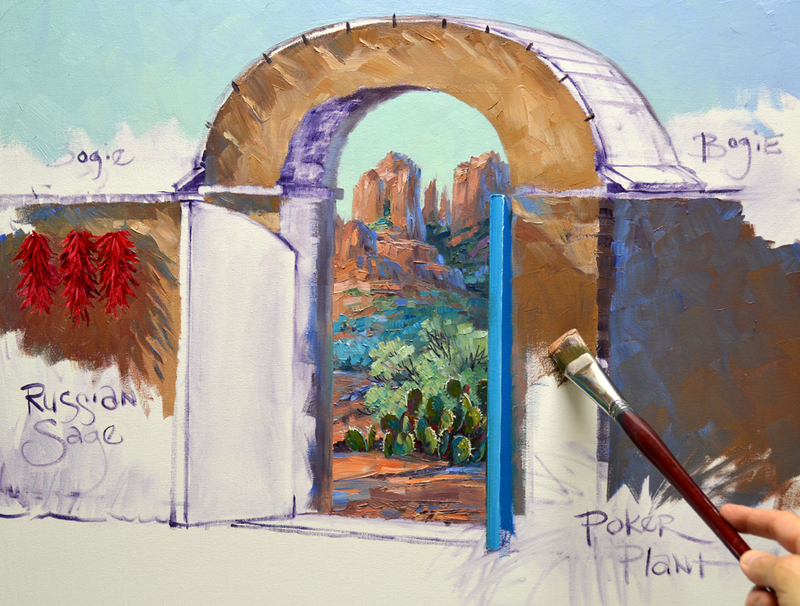 “Painting Forward” I begin work on the desert foliage in the middle ground. 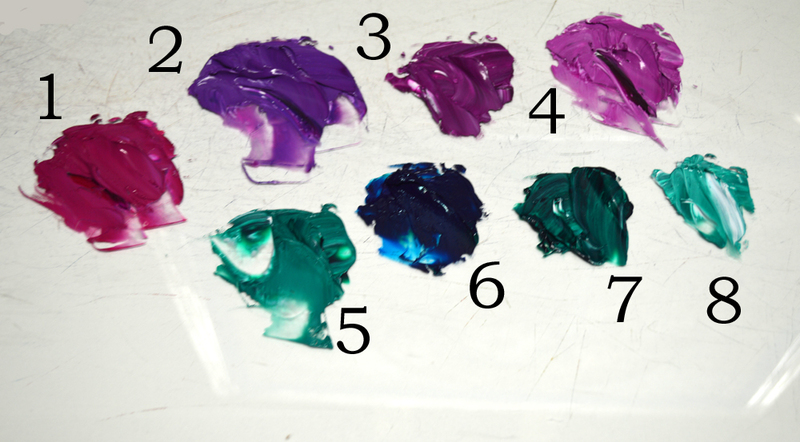 The leftover oil paint from the background is saved on the left side of my palette. It will remain usable for 3 to 4 days. I’ll have it if I need to go back and make any adjustments. The old wall will be painted with several shades mixed with MUD + Cadmium Yellow Medium + White. 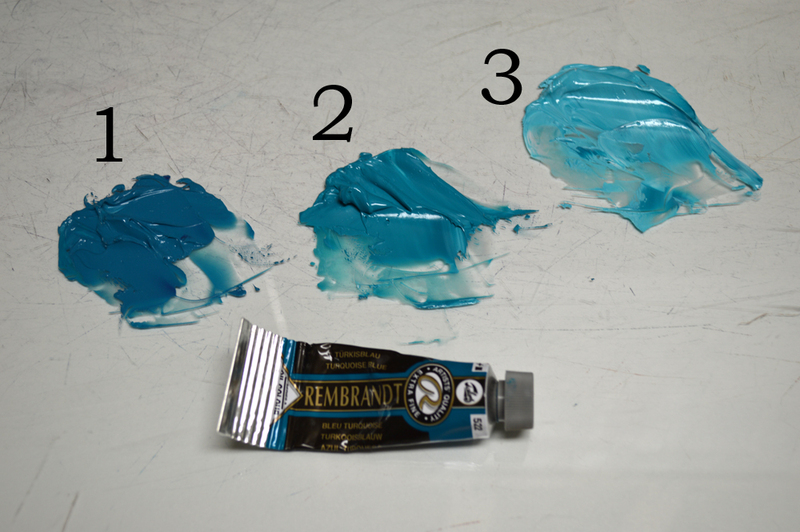 The dab of Blue is Ultramarine Blue + a tiny amount of MUD + White. The entire surface of the wall is covered. Crumbling plaster leaves the adobe bricks exposed in a few areas. The dark, irregular shape is blocked in first. Then the individual bricks are delineated. I just want to give an impression of them, not outline each one. The wall of the old gate is finished. 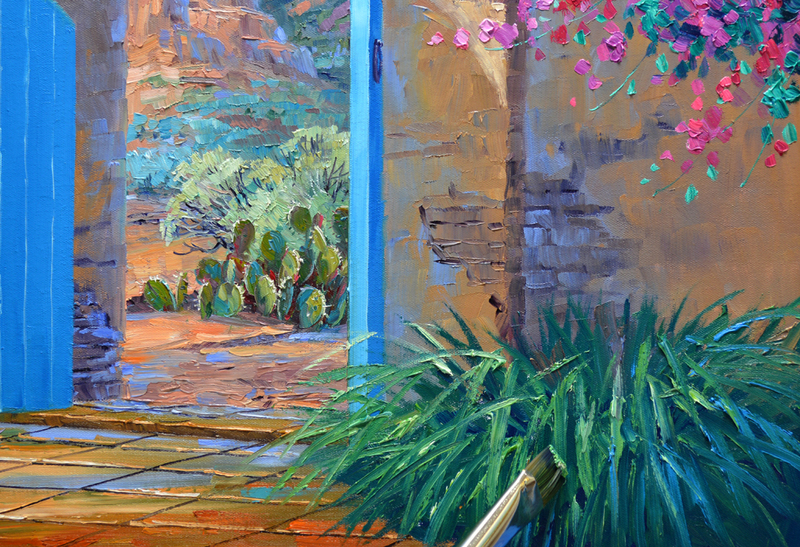 A few strokes of Blue are added into the adobe bricks, this will make them fall behind the Poker Plant in the foreground. 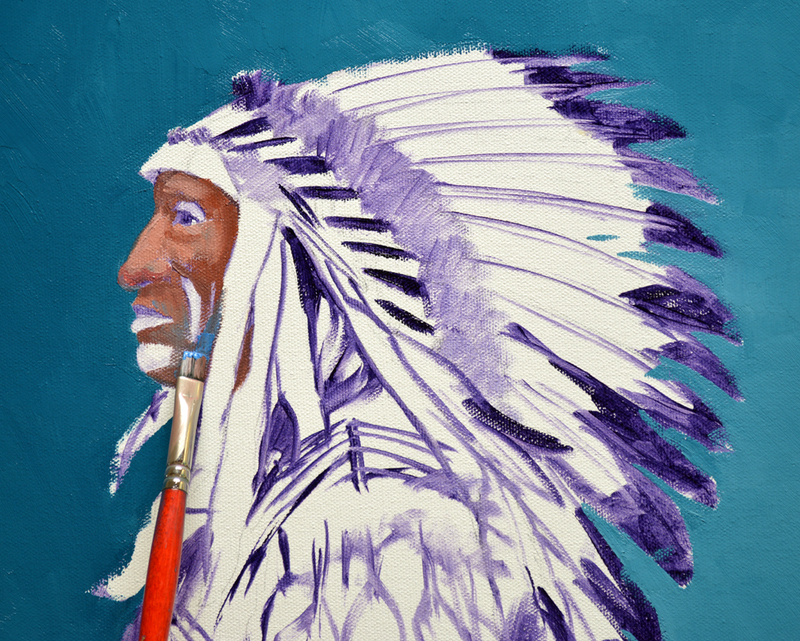 Painting another Indian Portrait just in time for Father’s Day. If you’d like to go directly to my eBay auction CLICK HERE. This auction ENDS at 8 PM Central Time, TUESDAY, June 16 so don’t linger. My paint mixtures for the face are shown above. #1. Two shades of Cerulean Blue + White. #2. Pure Cerulean Blue from the tube. #3. A dab of pure Terra Rosa. #4. 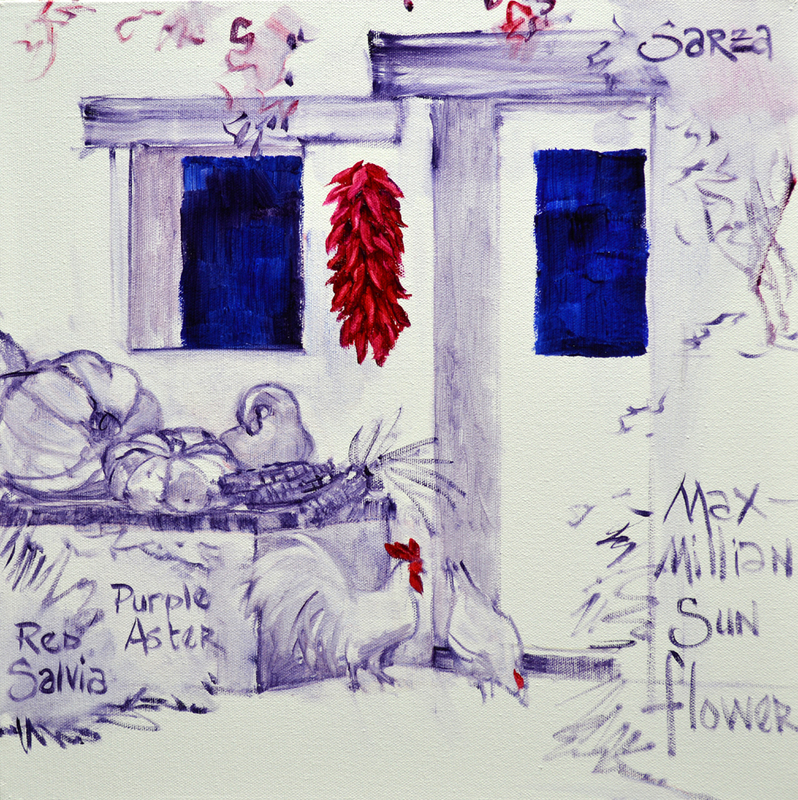 Three mixes in different proportions of Terra Rosa + MUD (Ultramarine Blue + Alizarin Crimson) + White. #5. Three shades of Terra Rosa + White. #6. Terra Rosa + Cadmium Red Light + White. #7. MUD + Liquin. 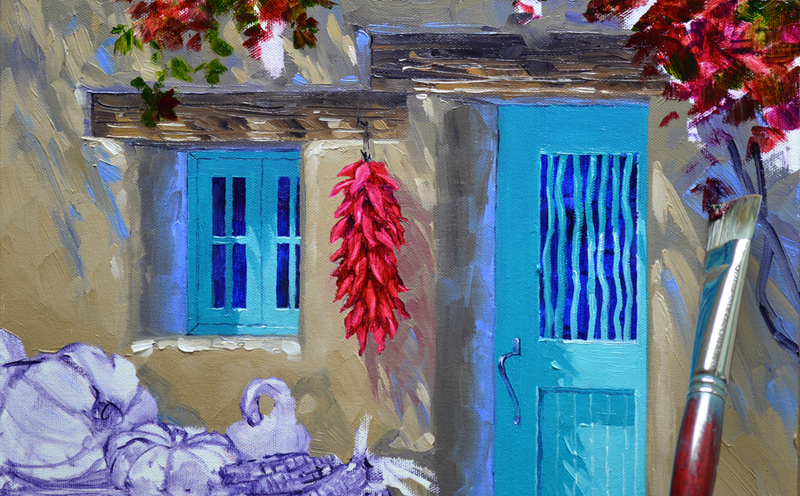 The background was covered with mixes in various proportions of Viridian Green + Alizarin Crimson + Pthalo Blue + White. Now for the face. The shadows are blocked in first. Faces are divided horizontally into three color zones. The forehead is more yellow while the middle zone, the nose and cheekbones, is more red. This is because the skin is thinner here so blood vessels are closer to the skin. The lower face is bluer or cooler. These zones are more pronounced in men but if you look closely you can see the subtle changes in women. I drag some of mix #1 over the skin tones in the lower face to add the coolness. Bracing against the mahl stick to steady my hand the catch light and reflected light on the iris are added. To see the image larger just click on the picture. VIDEO TODAY! 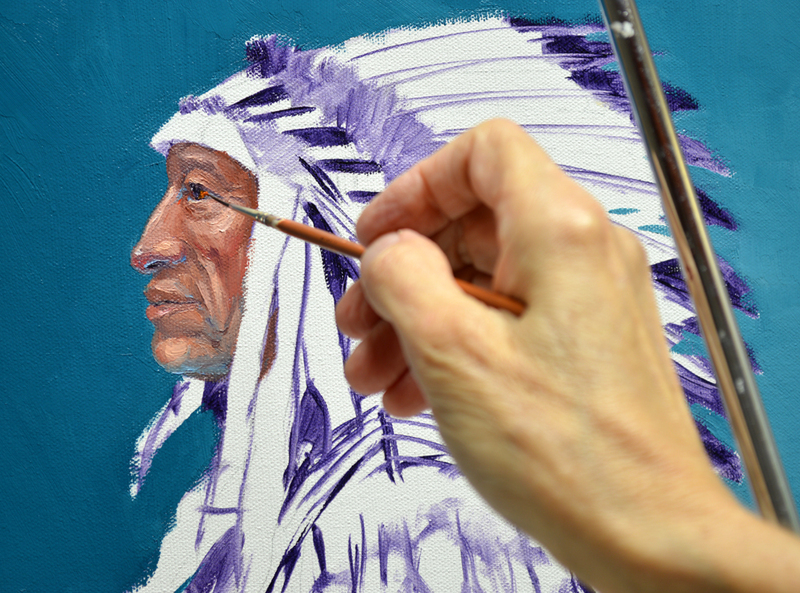 Blocking in the War Bonnet. 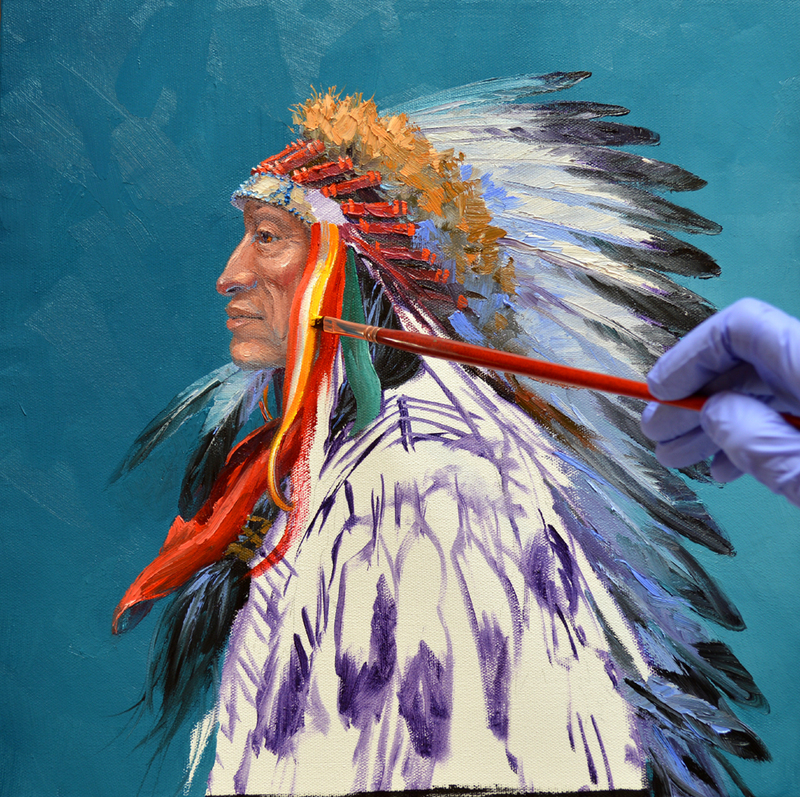 It’s fun painting the ribbons draping from the Headdress. Chief Iron Tail was an Oglala Lakota Chief and star performer in Buffalo Bill’s Wild West Show. Iron Tail was a popular subject for professional photographers in the late 19th and early 20th centuries. His distinctive profile was used as a model for the Indian Head nickel issued from 1913 to 1938. 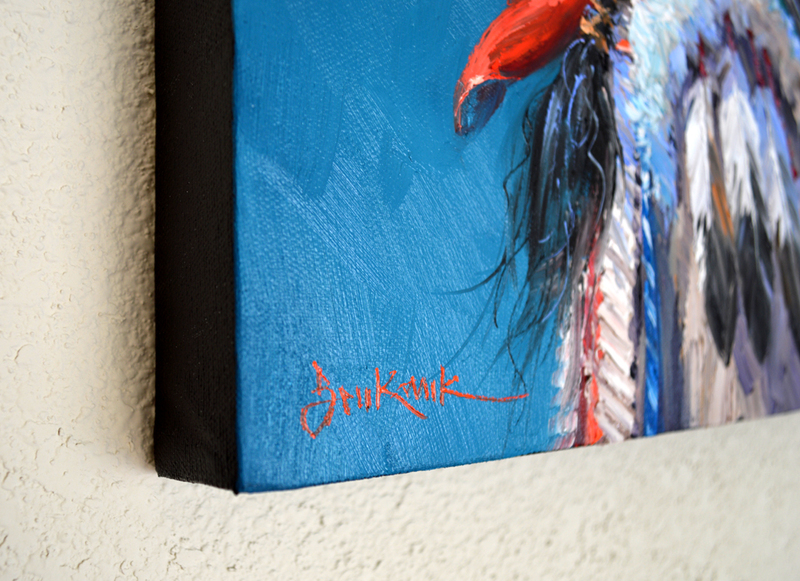 The piece is done on a gallery wrapped canvas with a 1 1/2″ finished edge. It’s ready to hang as soon as you give it! We even provide the hanger and nail! Father’s Day is just around the corner on June 21st. 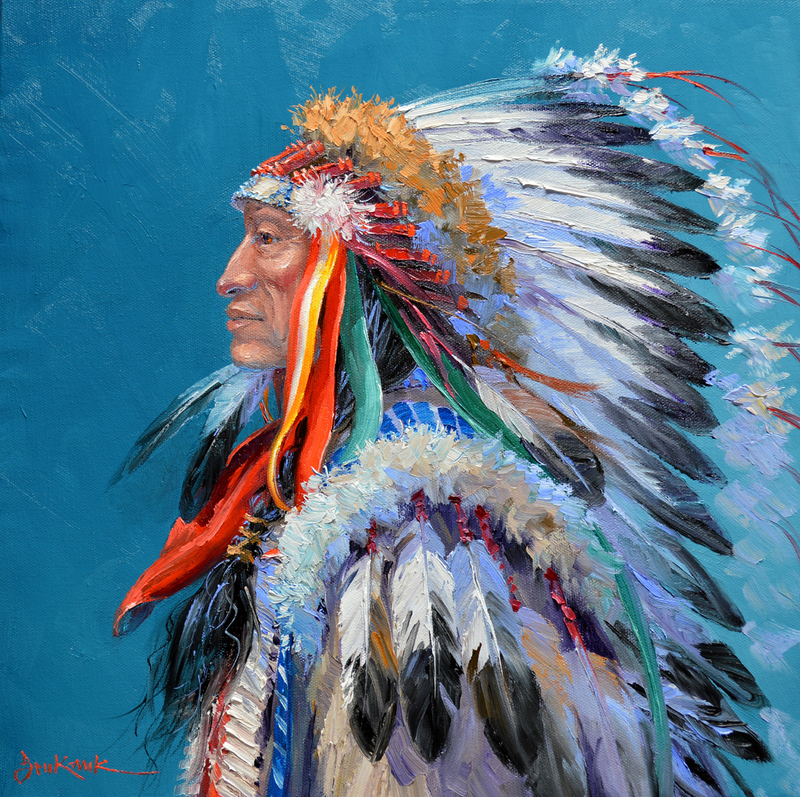 Chief Iron Tail would make a wonderful gift for that special dad in your life. Remember, a Senkarik Original Oil Painting will last for generations, expressing your love and appreciation for years to come. 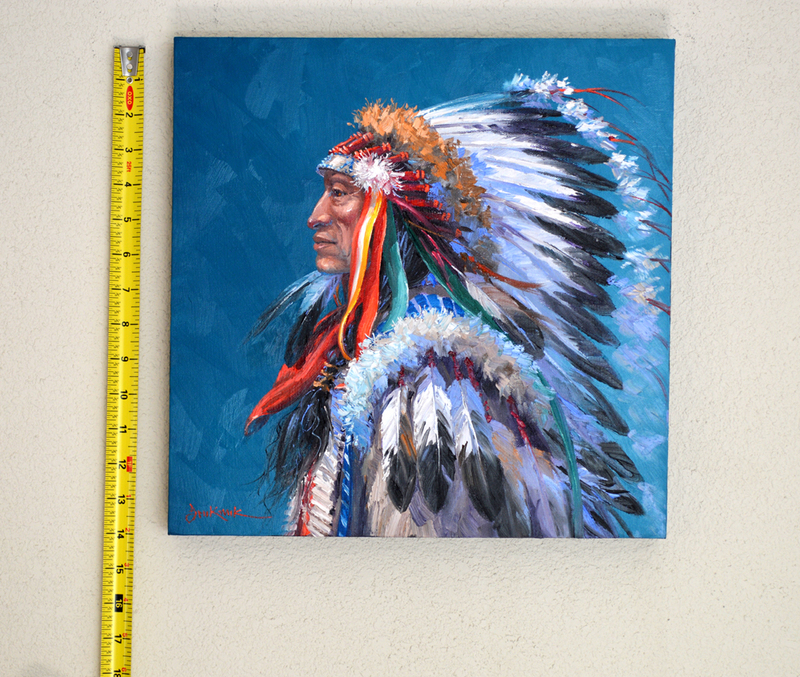 Chief Iron Tail measures 14 inches tall x 14 inches wide. 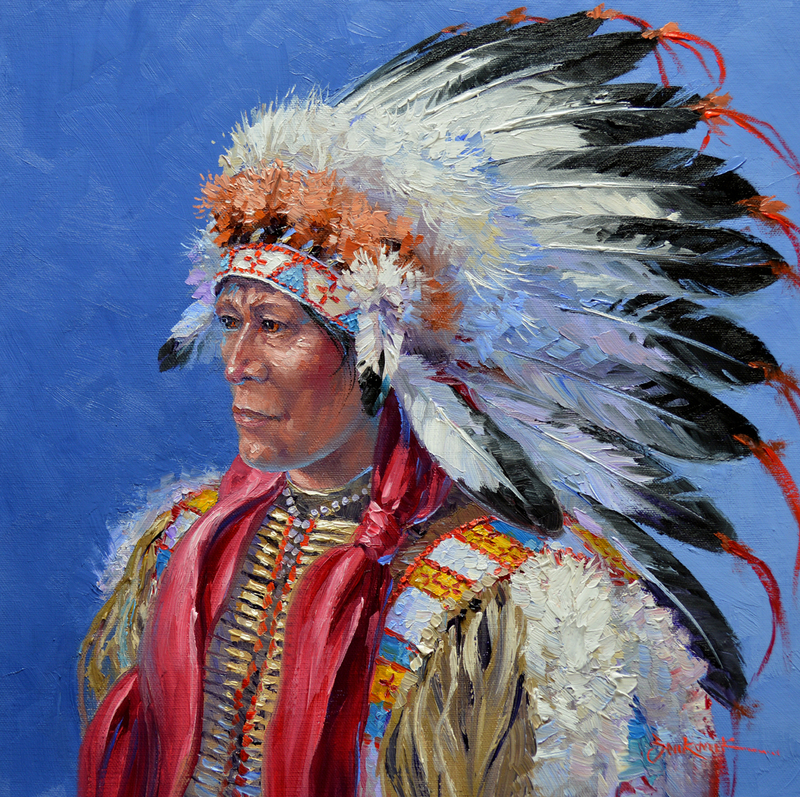 This size Senkarik Original Oil Painting retails for $690 in our Team Galleries. But to make it more fun we are starting the bid at A PENNY! That’s right, ONLY ONE CENT! 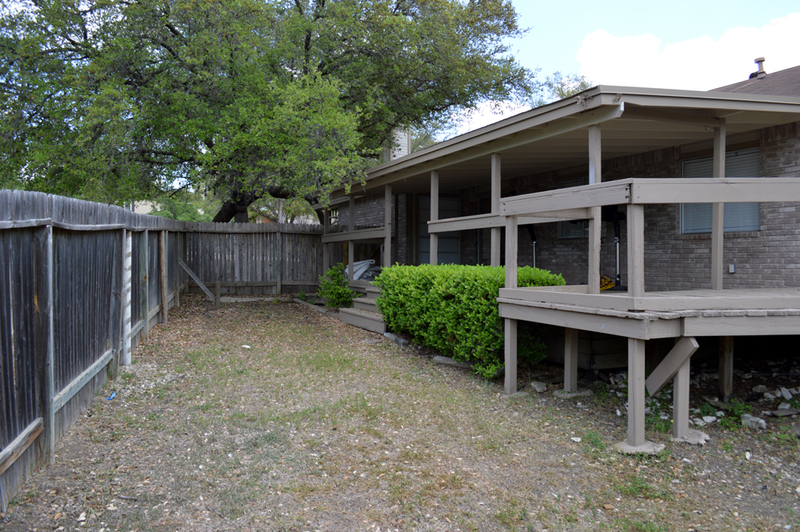 Don’t wait too long, the AUCTION ENDS TUESDAY, June 16 at 8 PM Central Time. If you’d like the back of the painting personalized for the recipient please let me know as soon as possible when you win. You need to get the information to me Tuesday evening so I can schedule your painting to be picked up by FedEX on Wednesday. That way we’ll make sure it gets to you in time to give on Father’s Day. Jack’s newest article has just been published on FineArtStudiosOnline. Several of Jack’s readers say this is one of his Best! CLICK HERE to read TRUTH. 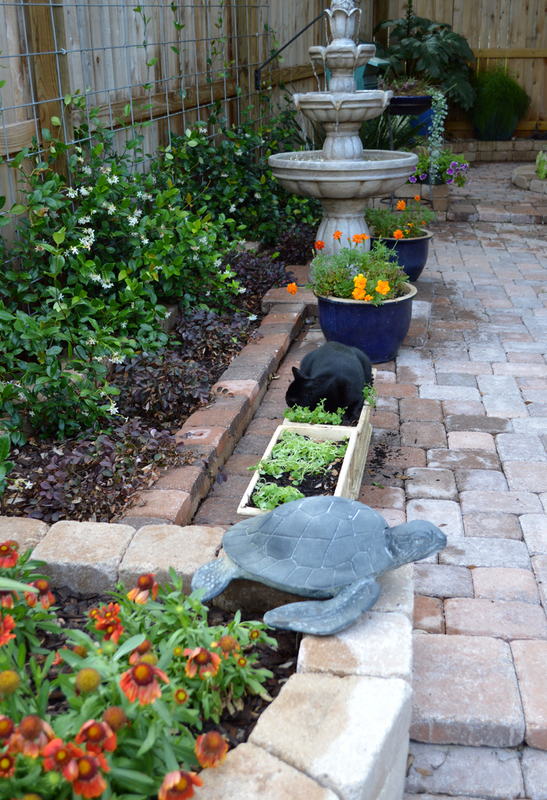 I planted some Catnip in the garden this morning. When I returned from putting the plastic containers in the recycle bin guess who I caught IN the Catnip? LITTLE SISSIE!!!!!!! 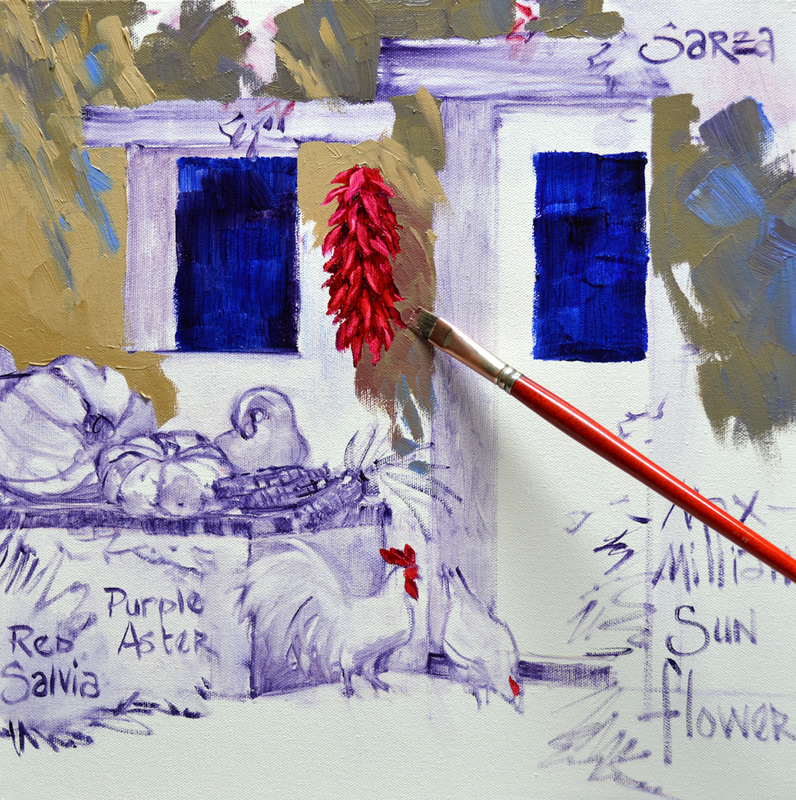 It’s time to come back and add the opaque leaves on the Sarza. The washed in foliage is now completely dry. 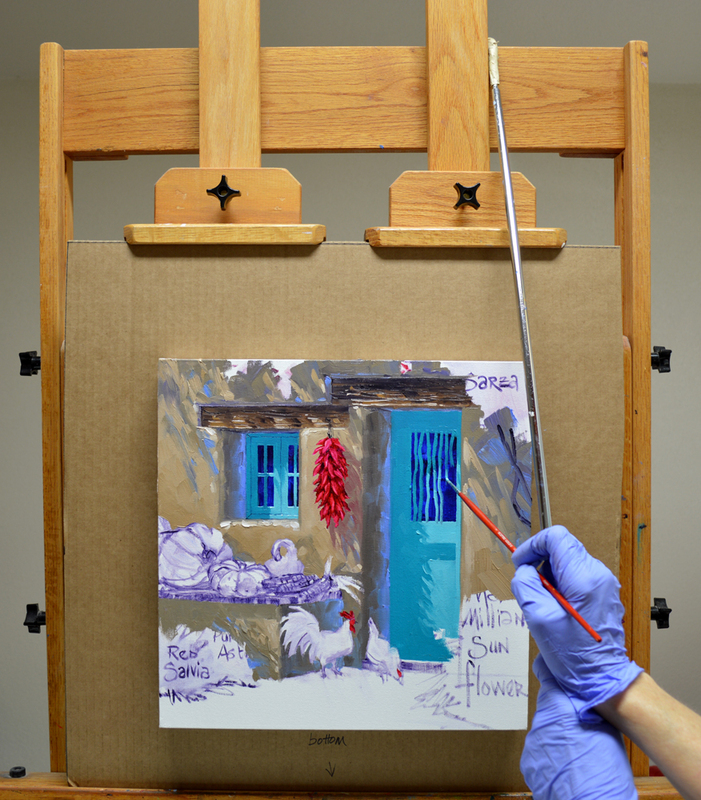 Mixtures of Alizarin Crimson + White, Magenta + White and Sap Green + White are used. 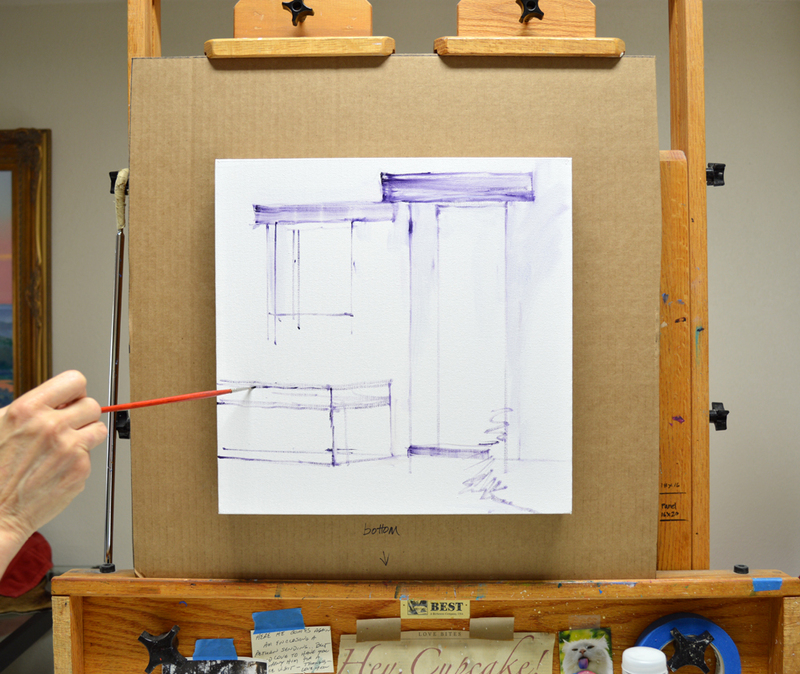 I apply the paint with thick brushstrokes, giving it lots of texture. 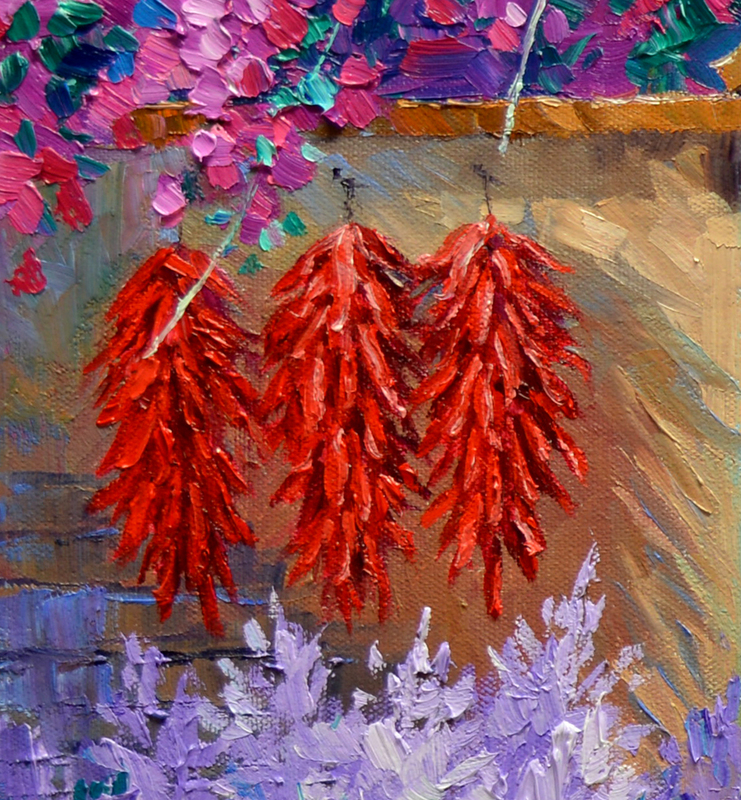 Chili Ristras are a signature trademark of Santa Fe. 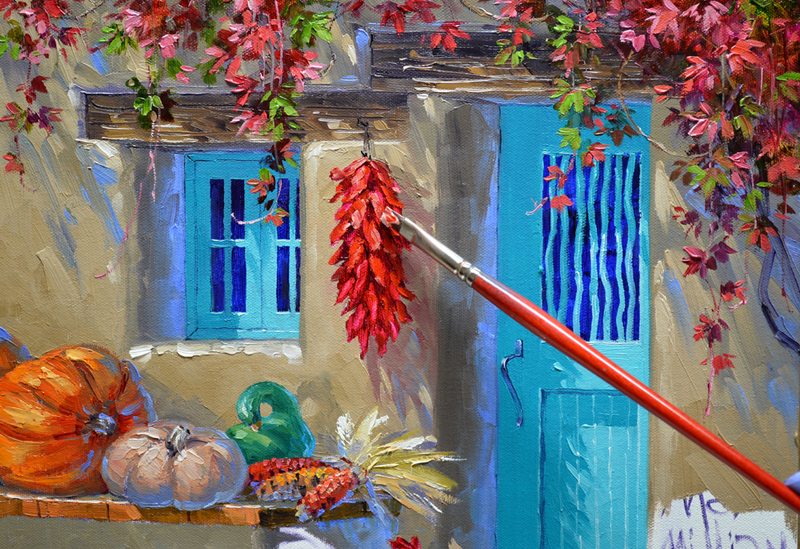 The individual peppers are sculpted with a small Bright brush. If you’d like to find out more about the brushes I use CLICK HERE. VIDEO! 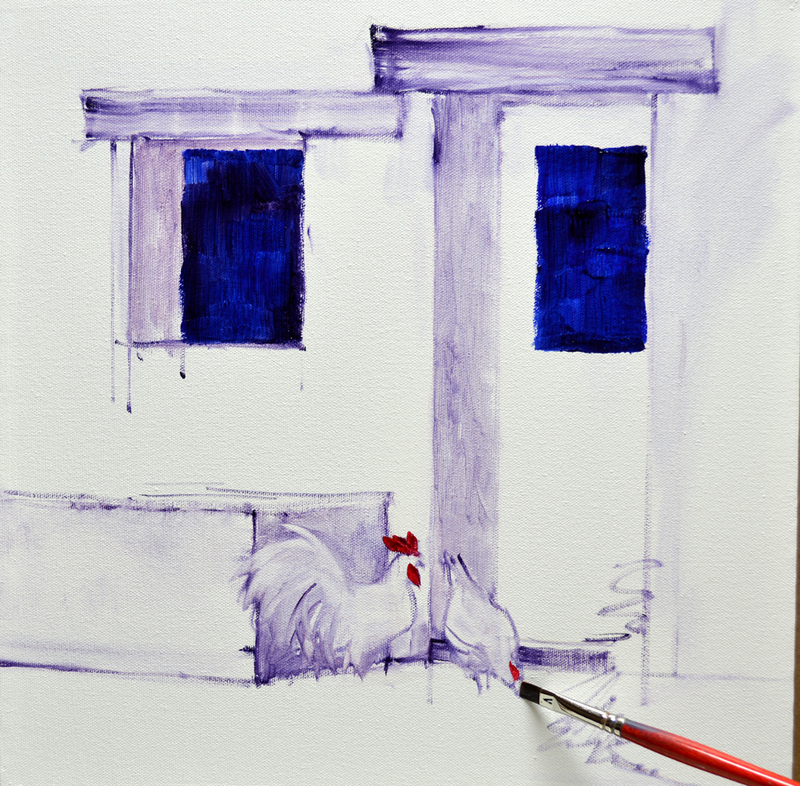 Painting that cute little Rooster and hen. I’d like to take this opportunity to thank all of you who have emailed to say how much you enjoy the videos. I really appreciate your kind words. A few have mentioned they’ve not been able to make to audio work. OOOPPPPS!!! There is no narration. I’m very fortunate as an artist, I’m having a difficult time keeping up with my painting commitments. Time does not allow me to narrate the videos. I’m afraid I’m doing the best I can at this time just to get these posted for you. But maybe I can sometime in the future. Maxmillian Sunflowers are blocked in with my usual sequence of Flowers First, Leaves Last. The Bounty of Fall. is ready to join the other three paintings in the Quartet. Can’t you just hear the cluck, clucks of the little hen looking for a few stray kernals of Indian Corn? After finishing the satillo tile floor I use some of the leftover color to make the tiles on top of the small shelf by the door. Notice how the floor is made bluer toward the back. The coolness of the color makes it recede. VIDEO TODAY! Painting the Pumpkins! 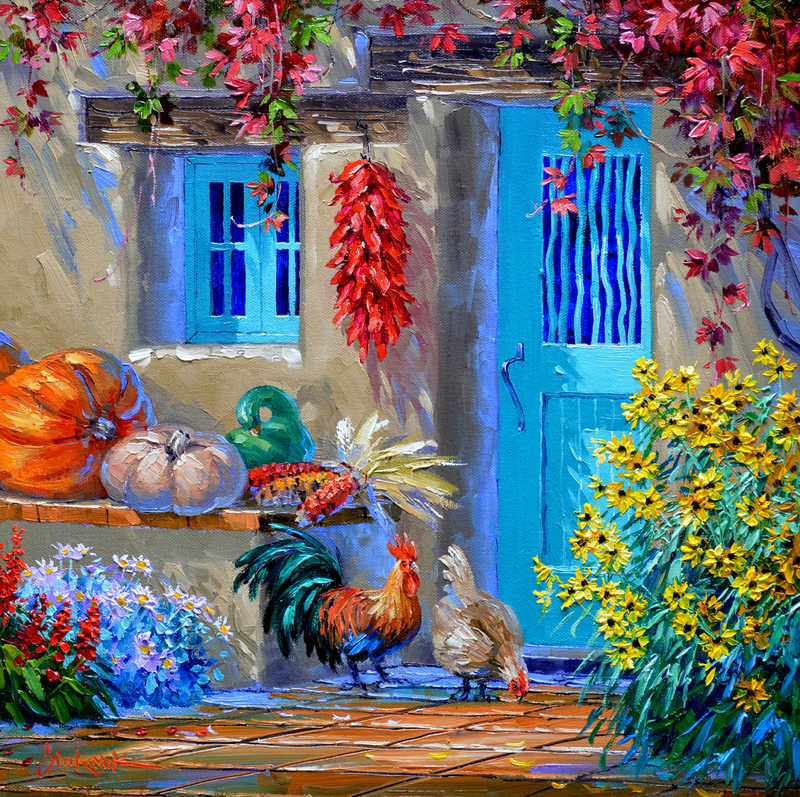 Pumpkins, Gourds and Indian Corn, isn’t Fall wonderful? 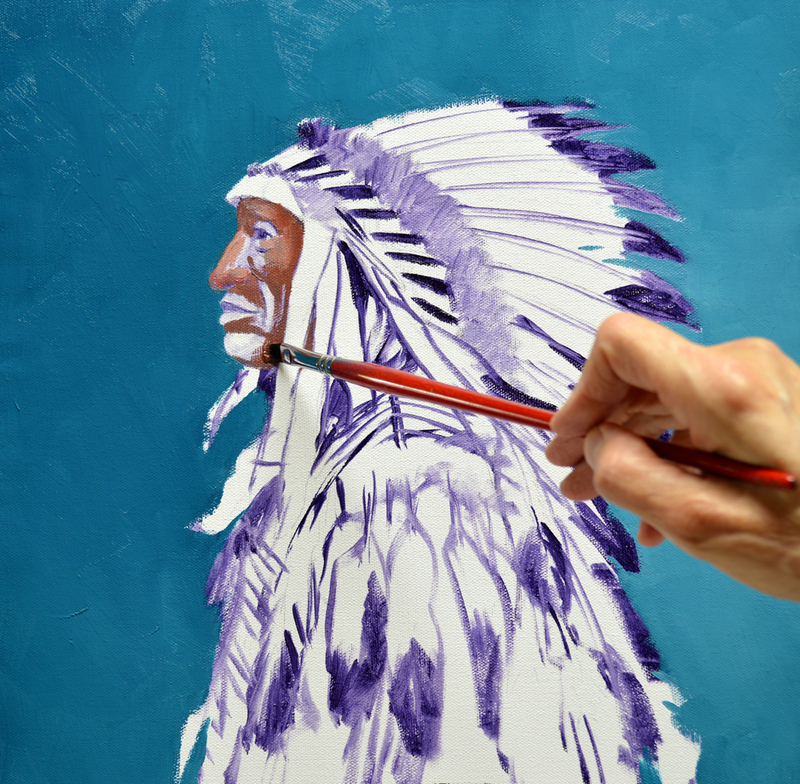 This is one of the things I love about doing commissions, I get to paint some different subjects. 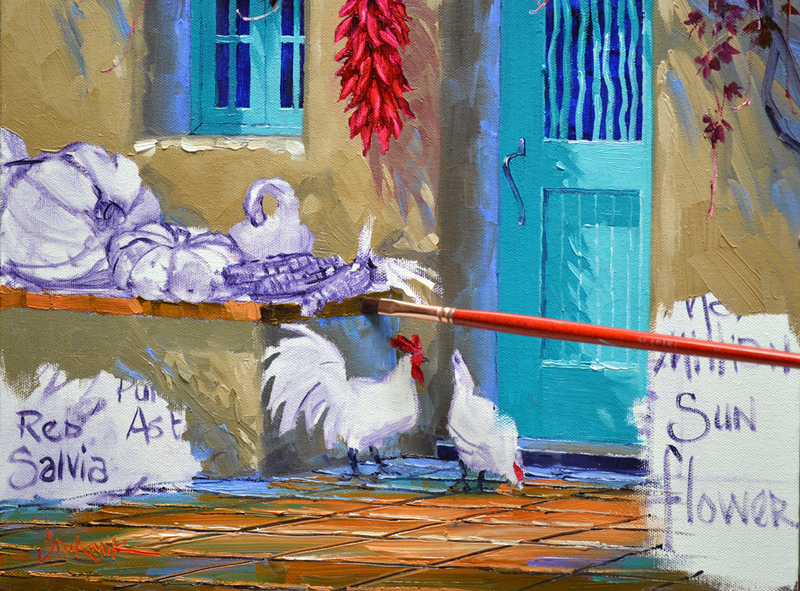 In our next session we’ll be working on the chickens, hope you’ll come watch! 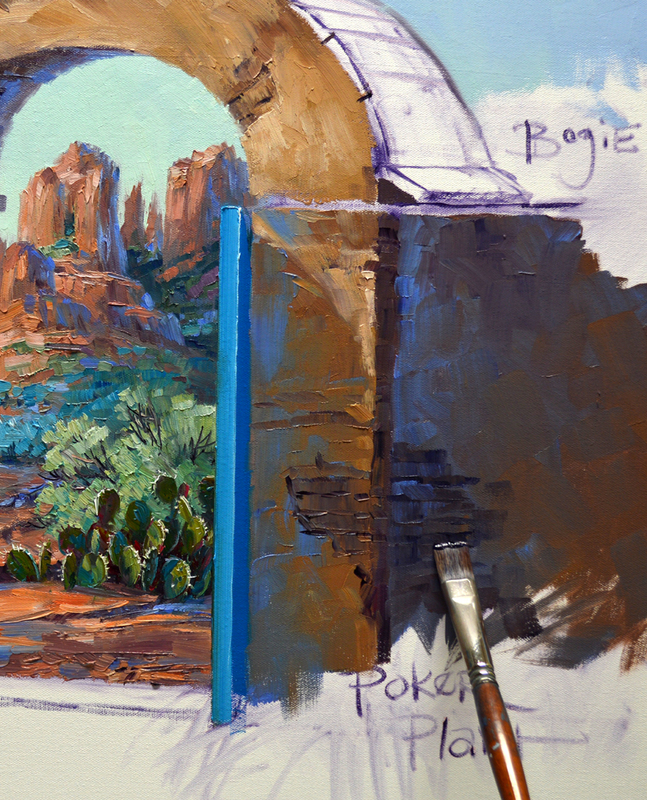 I begin painting with the adobe walls. 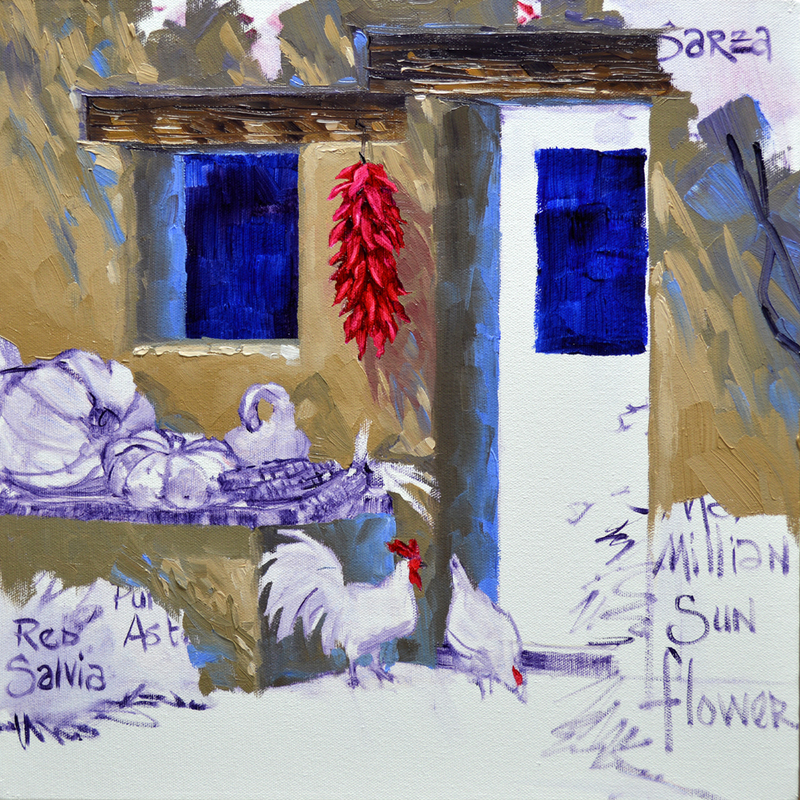 Various mixes of Ultramarine Blue + Cadmium Orange + MUD (Ultramarine Blue + Alizarin Crimson) + White are used. 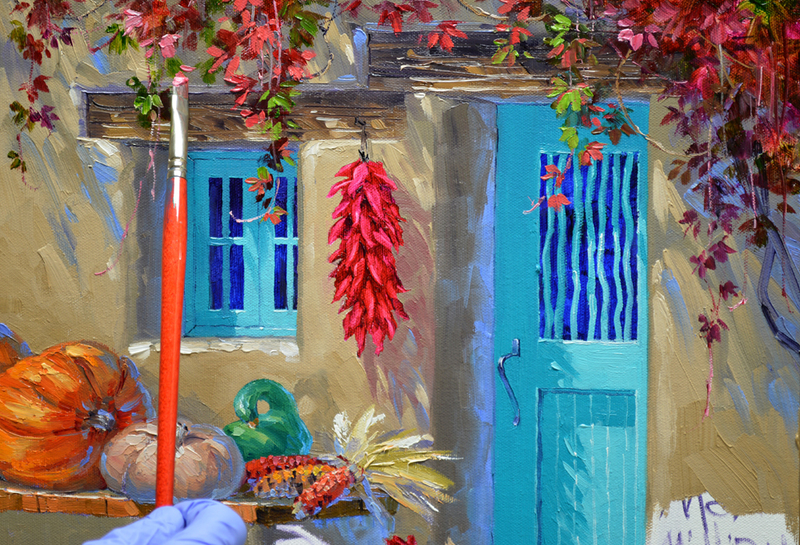 Working on the shadow of the chili ristra I add a little bit of Alizarin Crimson into the mixture. This is because the red of the chilies reflects on to the wall beside them. 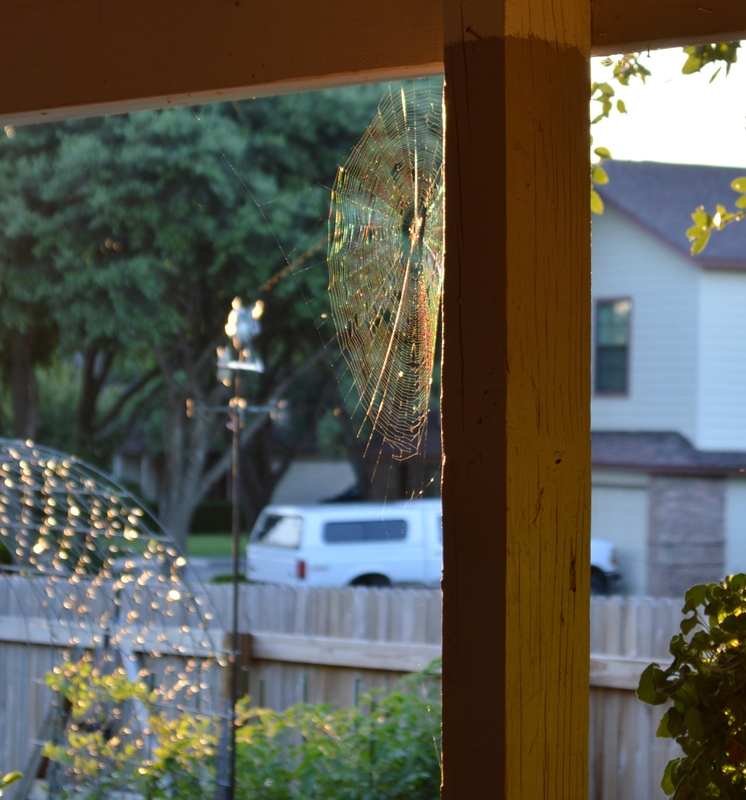 The back edge of the side walls on the window and door is made bluer, or cooler, to make it recede. 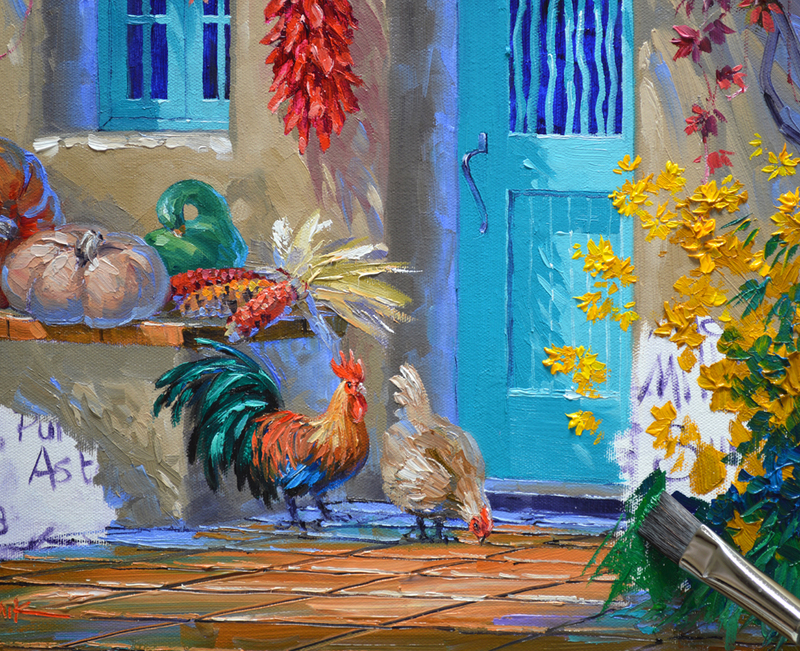 This follows a simple rule that helps to increase the feeling of depth in a painting: Warm Colors Come Forward, Cool Colors Go Back. 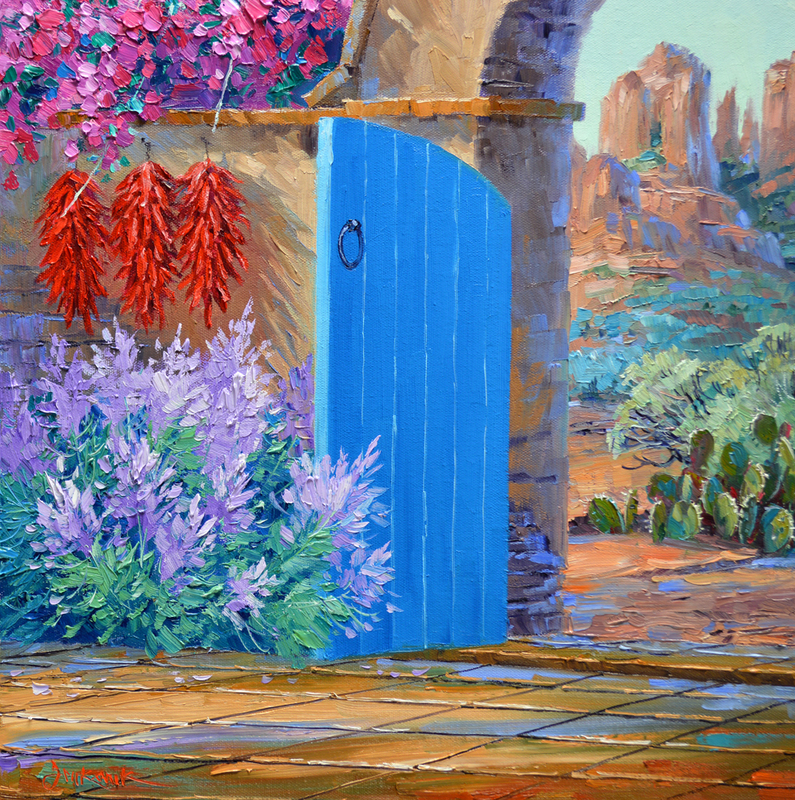 A special color is pulled out for the Santa Fe window and door: Turquoise Blue. Three shades of Turquoise Blue + White are mixed. The light and shadow pattern on the door is blocked in with the Turquoise mixes. Willow twigs cover the window part. My wrist is braced against a mahl stick to steady my hand as I drag them over the dark, washed in area of the opening. For the Sarza, or as some call it Virginia Creeper, I make washes with a couple of other colors that are not normally found on our palette. #1. Magenta + Liquin. #2. Alizarin Crimson + Liquin. #3. Sap Green + Liquin. The three different washes are ramdomly scumbled on the canvas for the leaves of this multicolored vine. I let some of the areas remain very transparent in order to give luminosity to the foliage. 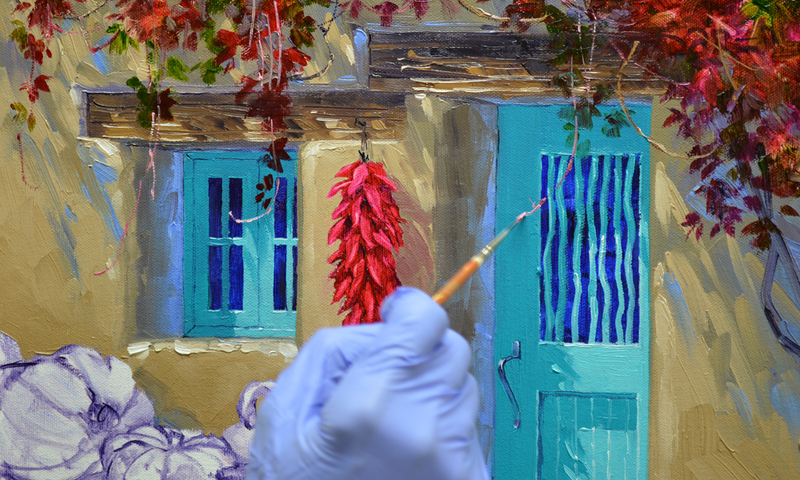 One of the most fun parts of painting vines is to add the little twigs and tendrils draping down. A fine liner brush is used to make the long streamers. 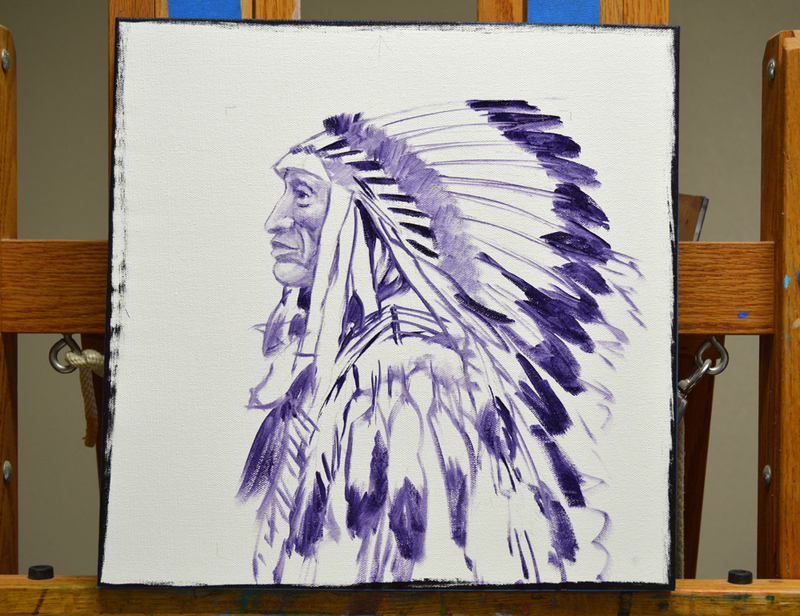 I’ll let the washed in areas dry, then I’ll come back later and add some thicker, opaque leaves. And……Don’t forget. My eBay auction for Chief Hollow Horn Bear ends tomorrow, Thursday June 4 at 8 PM Central time! To go to the auction CLICK HERE. Today we’re going back to Santa Fe. Established in 1607, this is the second oldest city in the United States. Only St. Augustine, Florida is older. Why is it called “The City Different”? Santa Fe has worked to preserve it’s unique, regional architectural style. Since 1958 all new and rebuilt buildings, especially those in the historic areas must be designed following the Spanish Territorial or Pueblo architectural style. The most common features are flat rooftops and rounded adobe construction. 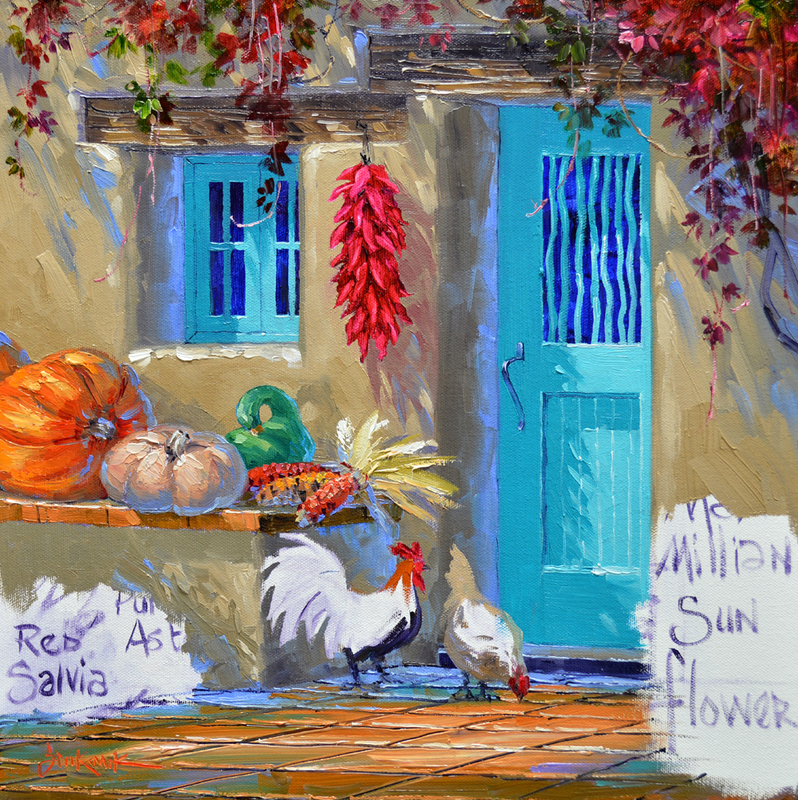 There is no other town in America that looks like Santa Fe, thus the name “The City Different”! So let’s begin my sketch with the typical adobe architecture. This is the last of four paintings I’m doing for our collectors. Thought you’d enjoy seeing the pen and ink sketches of the quartet as a reminder of the initial plan. You can click on the image to see it larger. I’m really glad chickens were a special request, they are so fun to paint. Their basic shapes are sketched in, then the red combs and wattles are washed in with Alizarin Crimson + Liquin. Using the same wash I block in the strand of chili peppers.